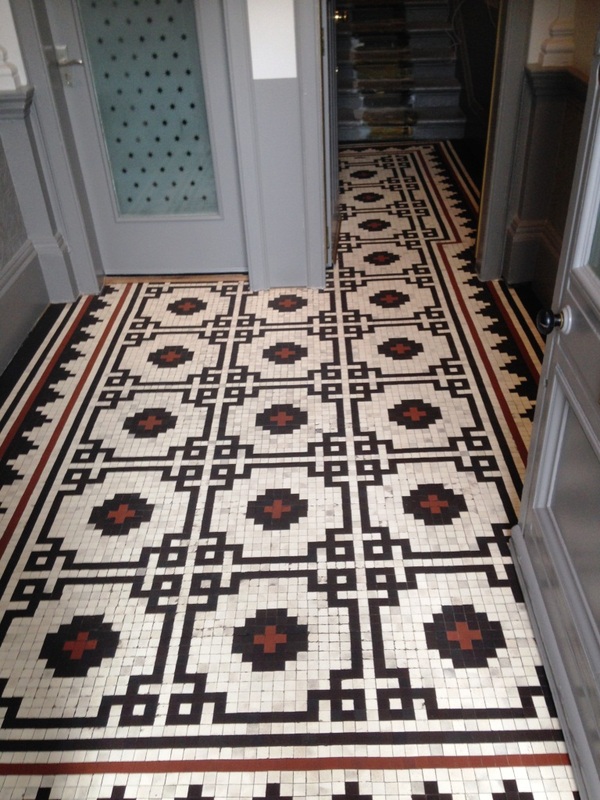 I thought you might be interested in these pictures of a tile restoration that we carried out in the hallway of a victorian property in the West End of Glasgow. Glasgow is actually the most populated city in Scotland and the third biggest by population in the whole of the UK so naturally a busy location for us. 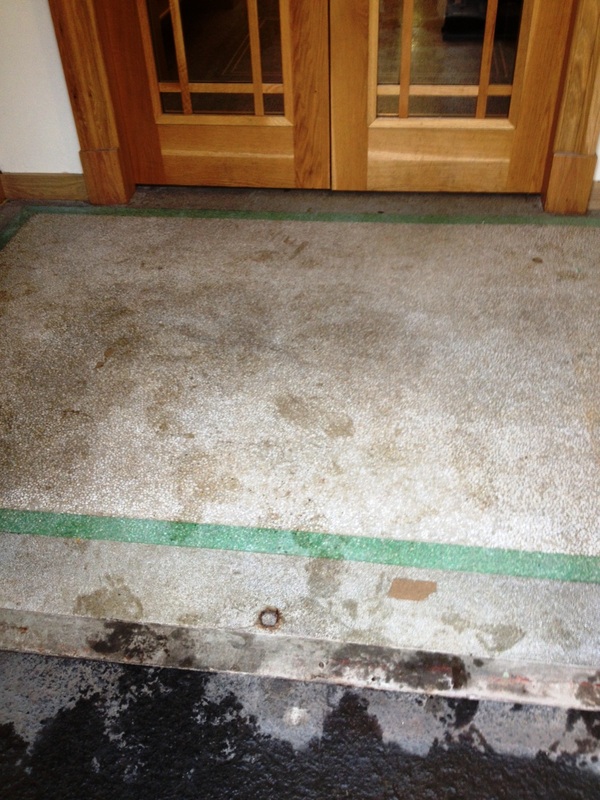 The floor had been previously covered in carpet and as a result was stained with adhesive and paint splashes. We popped in to do a site visit, so we could survey the floor and see for ourselves the condition of the floor. Although not in great shape, I was happy that the overall floor was in good physical condition and could be restored with the help the products and methods. I discussed with the client the process involved and the costs to put it right. They were happy to accept my quote and we booked the job in for later in the month. The job would take two days to complete, one day to clean and a further day to seal the floor. The first job was to clear the floor of the wooden carpet gripper by carefully chipping it off the floor. This took a bit of time and we had to be careful not to damage the floor further. Next, we started on deep cleaning the floor by applying Tile Doctor Oxy-Gel. This is a strong alkaline based cleaner and degreaser in gel form, its great for when a long dwell time is required to break down dirt, grime, acrylic sealers, stains and oil-based products and waxes. We left the Oxy-Gel to dwell for twenty to thirty minutes to ensure it got to work on breaking down the layers. 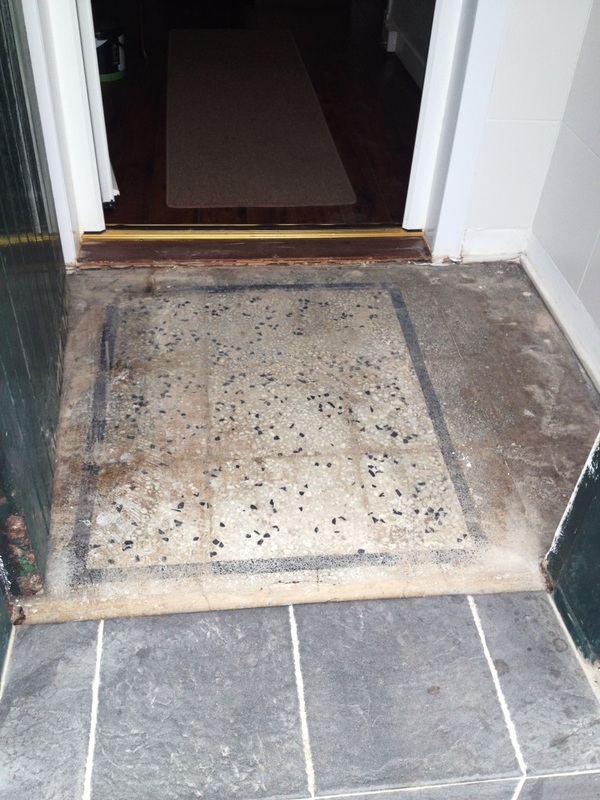 It was then worked into the tile using a black scrubbing pad fitted to a rotary machine with the slurry rinsed off the floor and extracted with a wet vacuum. 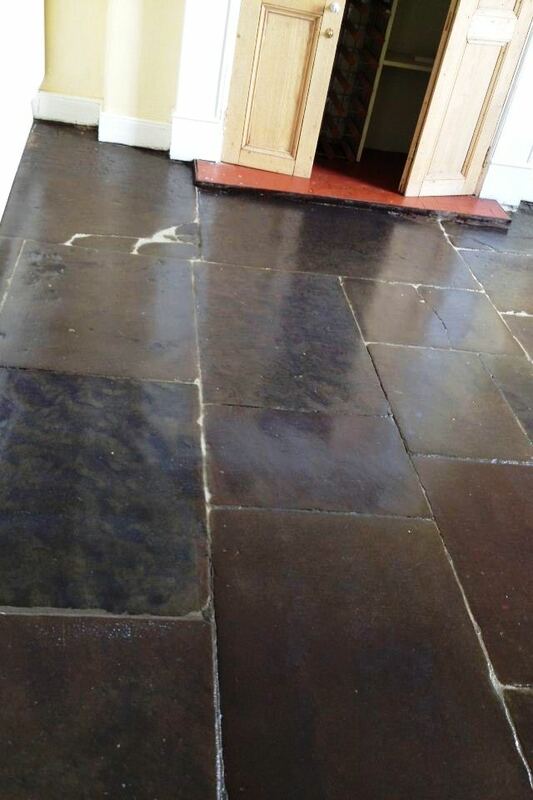 This process was carried out a few times to get the floor as clean as possible could before we gave a final scrub and rinse with Tile Doctor Acid Gel to combat any efflorescence issues that can occur on these old floors that do not have a damp proof membrane. I returned the following day to seal the floor checking first that it had dried using a damp meter. Once I was satisfied, four coats of Tile Doctor Seal and Go Extra were applied to the tiles to give the sheen finish asked for by the client. This process takes longer that you might think as you have to wait for the first coat to dry before applying the next and naturally this can vary depending on the conditions. 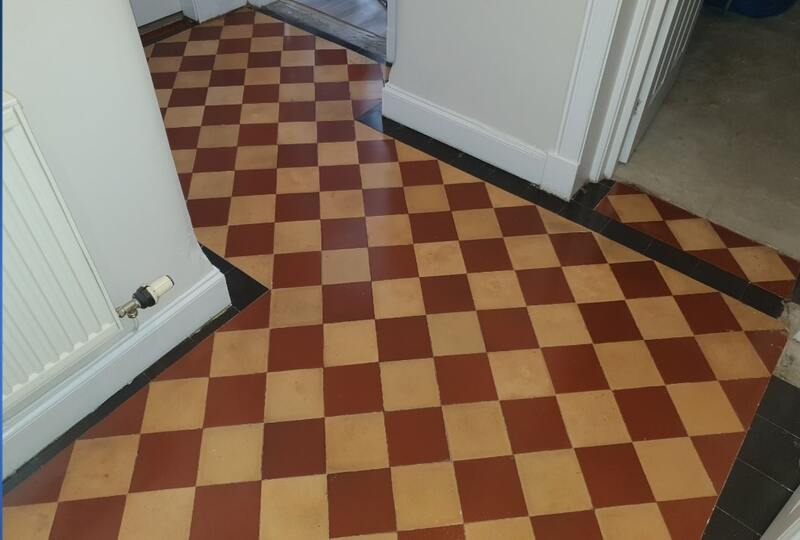 I chose Seal and Go Extra as these Victorian properties were built before the invention of damp-proof membranes so you need to use a fully breathable sealer that will allow dampness to rise through the tile and evaporate. 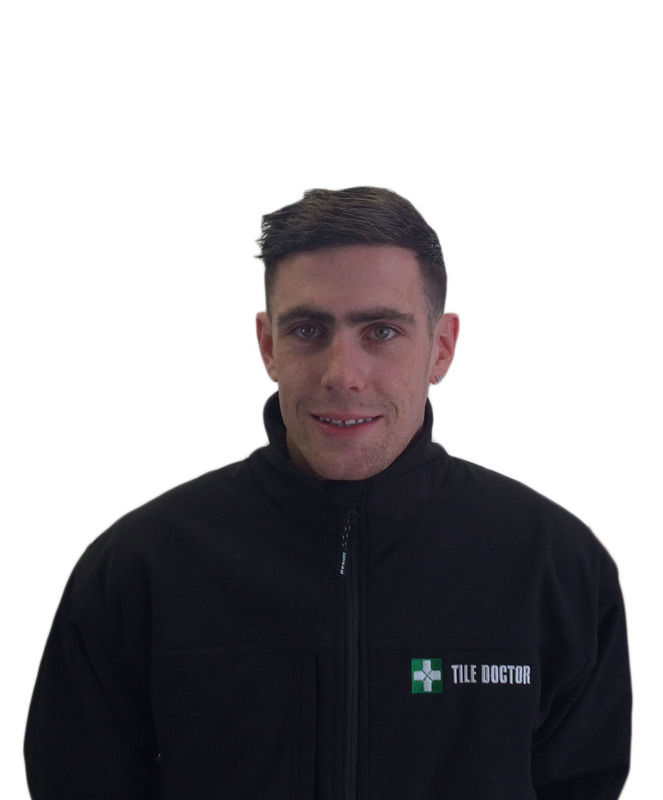 Use of a non-breathable sealer can lead to damp becoming trapped under the floor which can spread into the walls leading to rising damp. The sealer will protect the tiles and make it much easier to clean going forward, additionally it enhances the appearance of the tile leaving a sheen finish which allows the vivid colours to shine through. 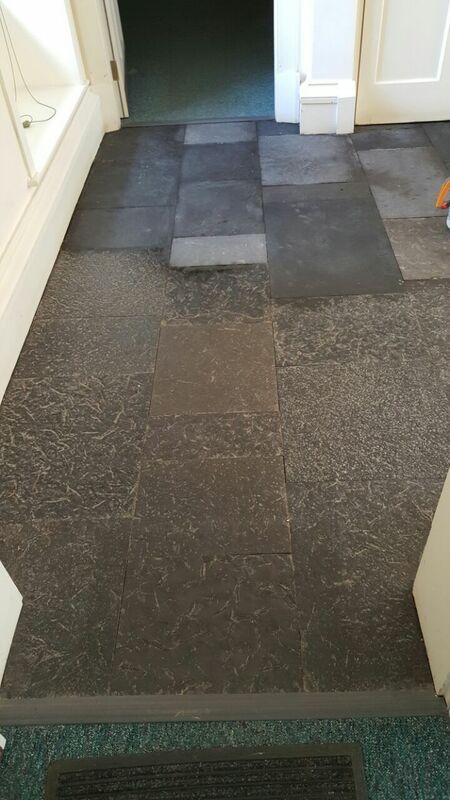 The client was very happy with the floor and quite amazed with the before and after shots, they had not expected the results to be as good. They would now be able to easily keep the floor clean and looking good for any visitors. Vestibules (aka entranceways) are not that commonly found in new build houses, but they certainly were a popular architectural feature back in the Victorian period. Many of the Victorian properties which are still in use today still contain their original geometric patterned encaustic cement tiles. These tiles can be very beautiful and colourful – that is if they’re kept looking that way with routine cleaning and maintenance. 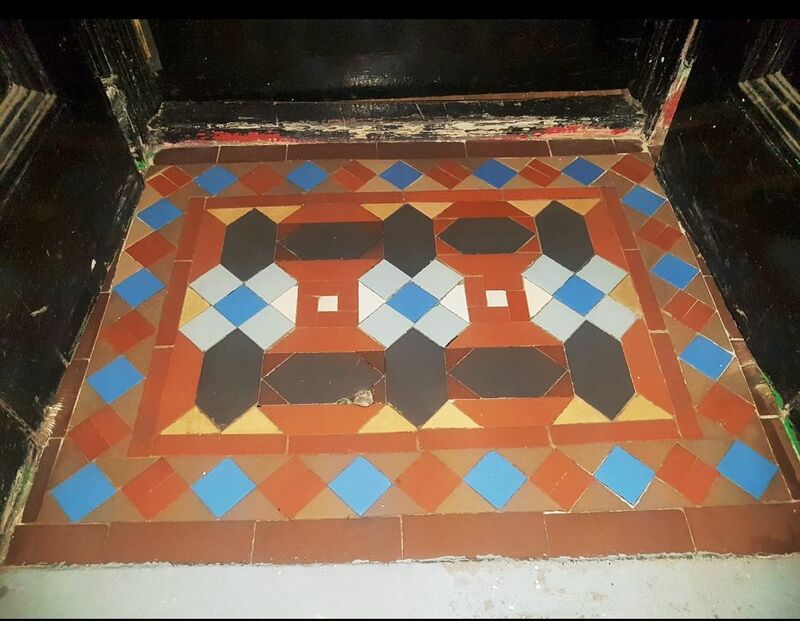 I recently visited a Victorian property in Glasgow’s West End to carry out the restoration of one of these tiled floor vestibules. 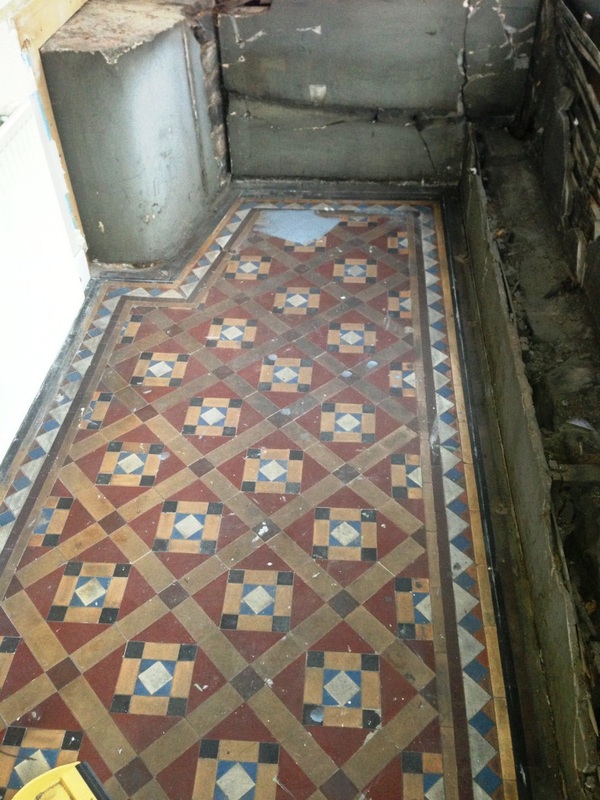 This Victorian tiled vestibule was in truly awful condition. 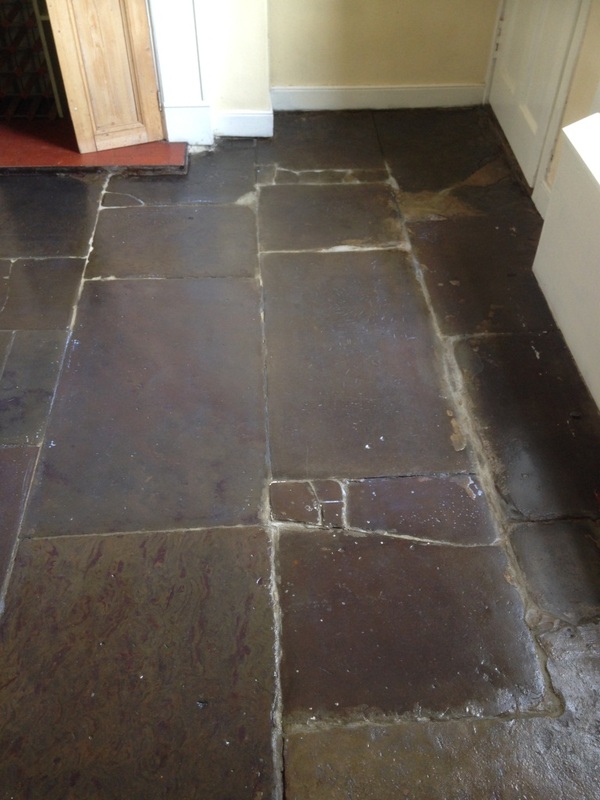 Not only were the tiles caked in years’ worth of muck and paint stains – some of the tiles were completely missing or, at the very least, loose and damaged. 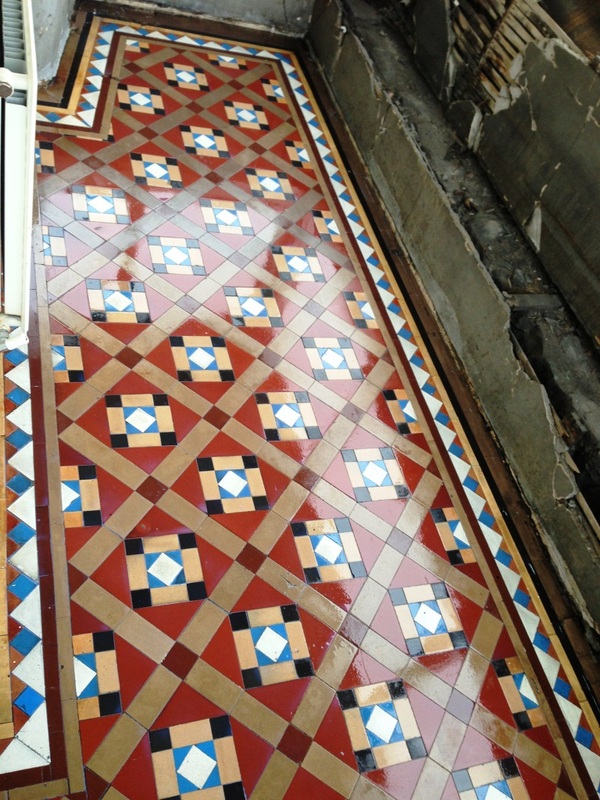 I could see that restoring these tiles back to their peak condition would require several days of work however the owner has keen to get the work done so we set a date for my return to complete the work. On the first day of work, our priority was to undertake a much needed deep clean of the tiles. This was done using Tile Doctor Pro Clean combined with Tile Doctor Remove and Go. 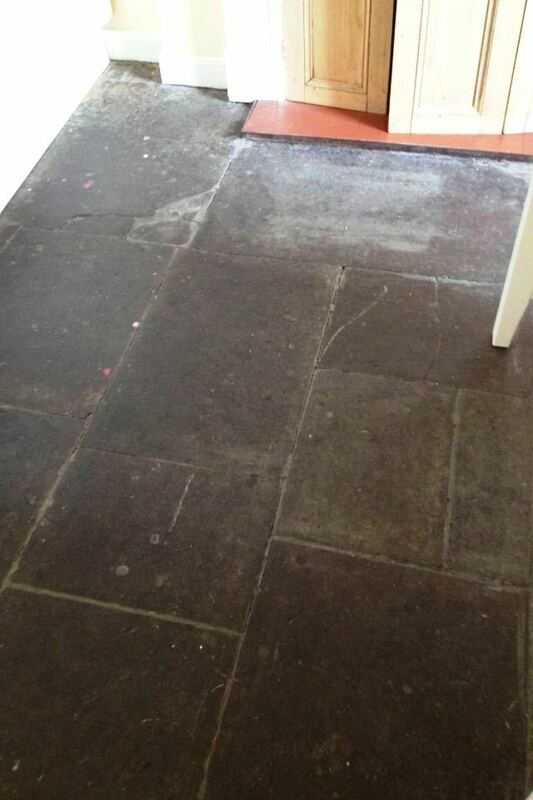 Pro Clean is an alkaline-based cleaner specialised for heavy soil removal, while Remove and Go is formulated to strip away any old sealers, as well as the paint splashes that were very prominent on these tiles. 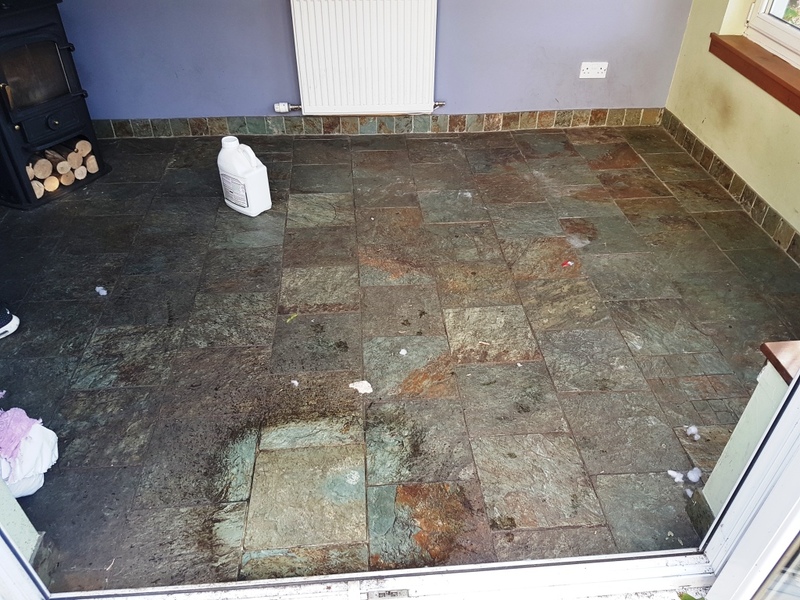 Th combined cleaning solution was left to dwell for a short period of time on the surface of the floor before being scrubbed into the tiles to cut through the thick muck. A steaming machine was used to ensure the products penetrated deep into the pores of the stone to extract ingrained dirt. 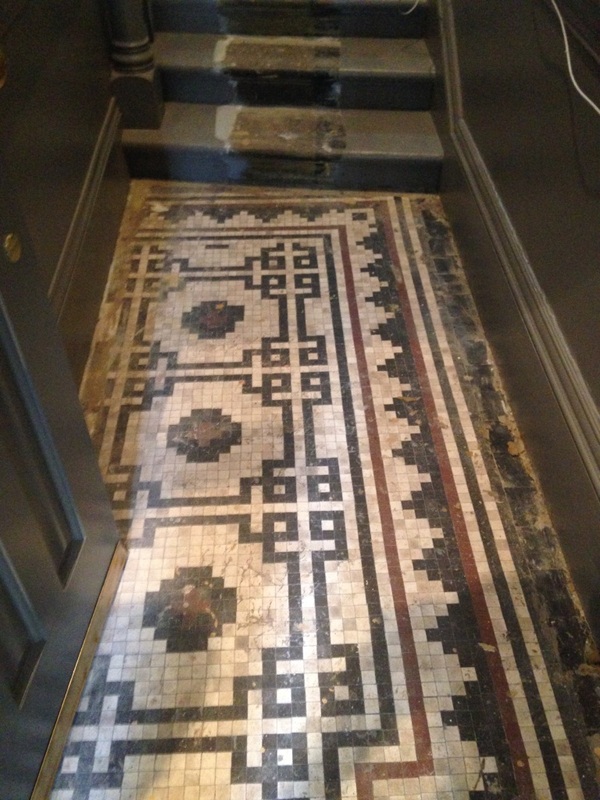 During the cleaning process, we could identify which tiles were loose, damaged and missing. These tiles were carefully removed and put to one side. Once the clean was completed the tiles were left to dry off overnight. The next the floor had dried, and we started to rebuild the floor. 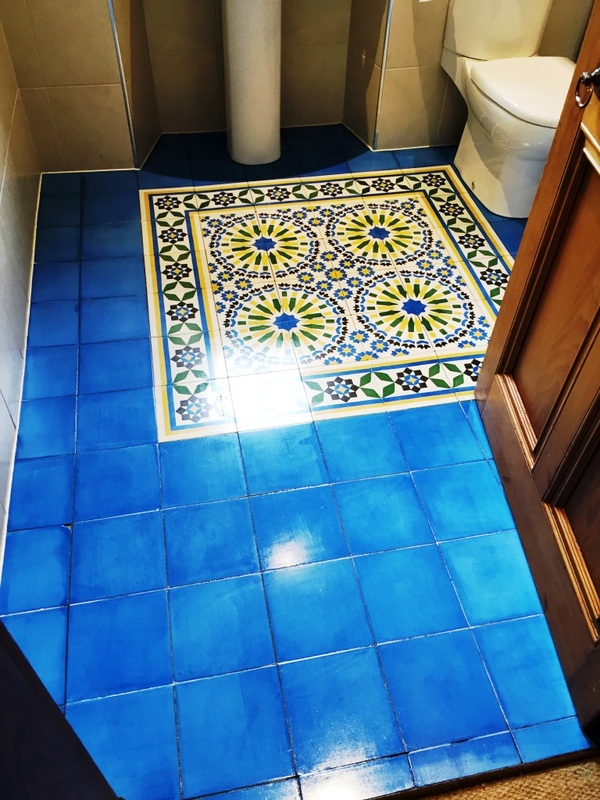 This involved installing and grouting new tiles that we had previously sourced for the job to match as closely possible with the original pattern of the floor. Next, the newly installed tiles were left to set, before we gave the floor an acid rinse using Tile Doctor Grout Clean-Up. This product removed any grout haze from the tiles and will neutralise any efflorescence salts that may rise up through the tiles as they dry. This issue can be quite a problem with older properties which don’t have a damp proof course installed. 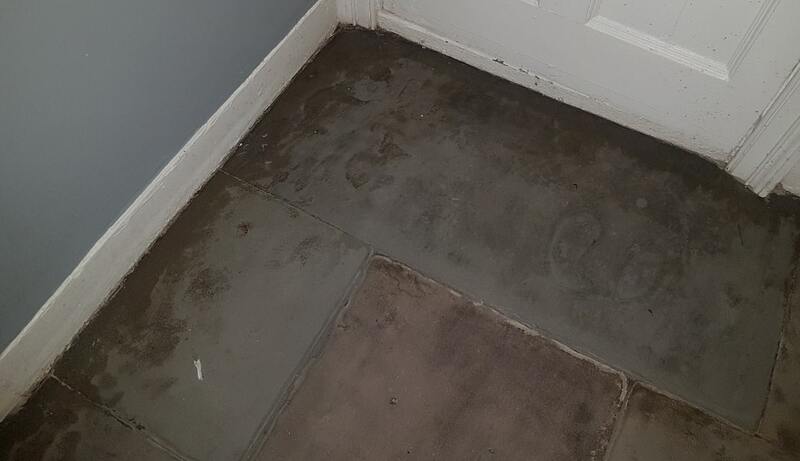 Once again, we left the floor to dry out completely overnight, this is especially important when applying a sealer to a tile as sealing damp tiles will lead to issues. We recommend the use of a damp meter at this point to ensure the tiles are indeed dry before sealing. 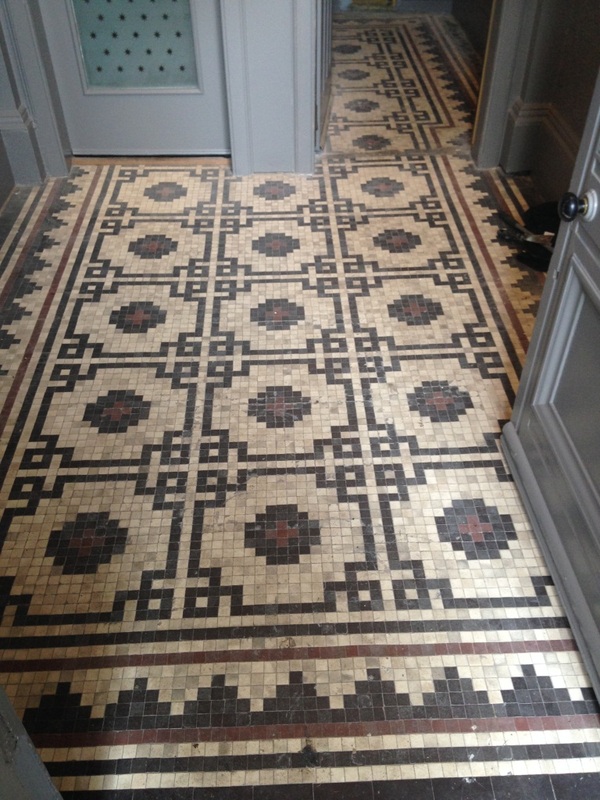 To seal the floor, we used three coats of Tile Doctor Colour Grow, which is ideal for these uniquely patterned Victorian tiles as it intensifies the different colours in the stone, while also offering a natural-look matte finish. 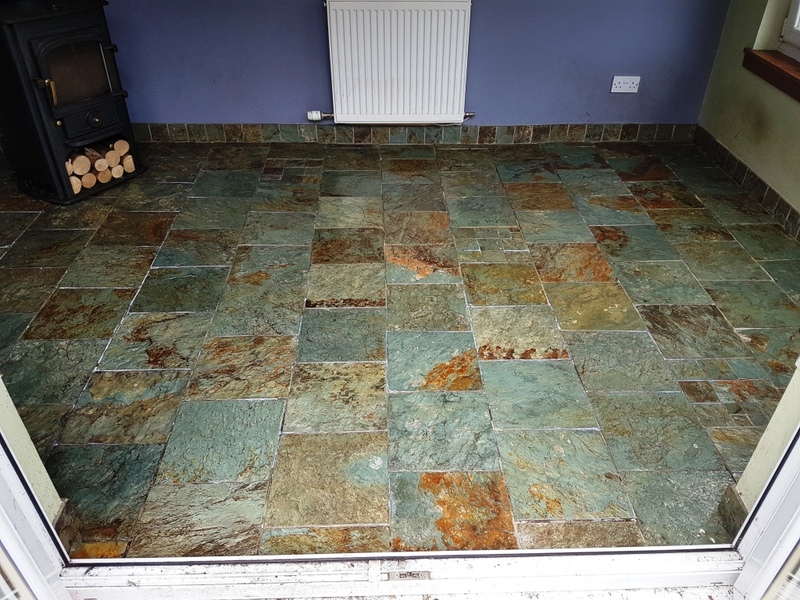 Of course, the sealer will also provide the tiles with lasting protection again dirt and muck and is also breathable so any damp rising up through from the sub floor will be able to evaporate. Photos really do speak louder than words in this case, as the restoration achieve some fantastic results. Take a look at the photo below – I’m sure you’ll agree the difference is incredible. Certainly, our very happy customer seemed to think so! 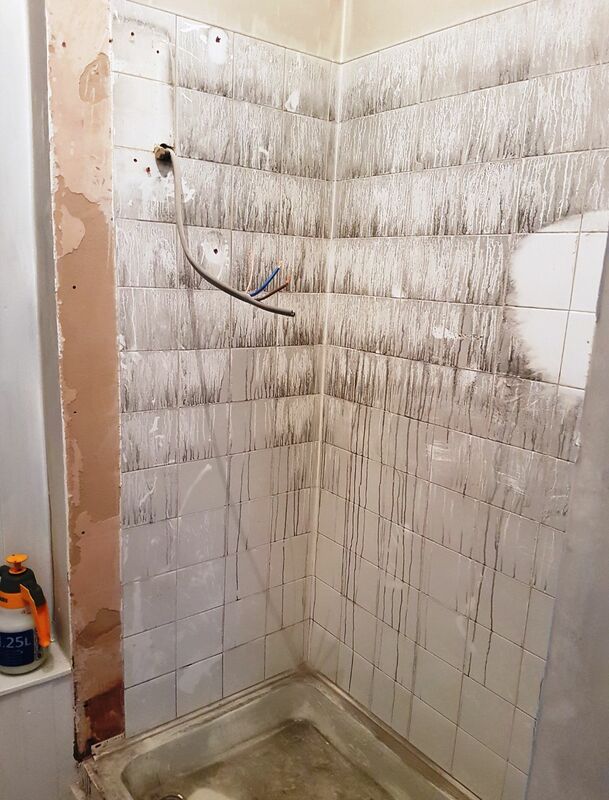 Below are a few photos of a smoke damaged shower cubicle where we were asked by an insurance company to restore the tiles following a house fire in the town of Ayr. Just south of Prestwick airport on the South West Coast of Scotland, Ayr is built along the river of the same name and dates all the way back to 1205. 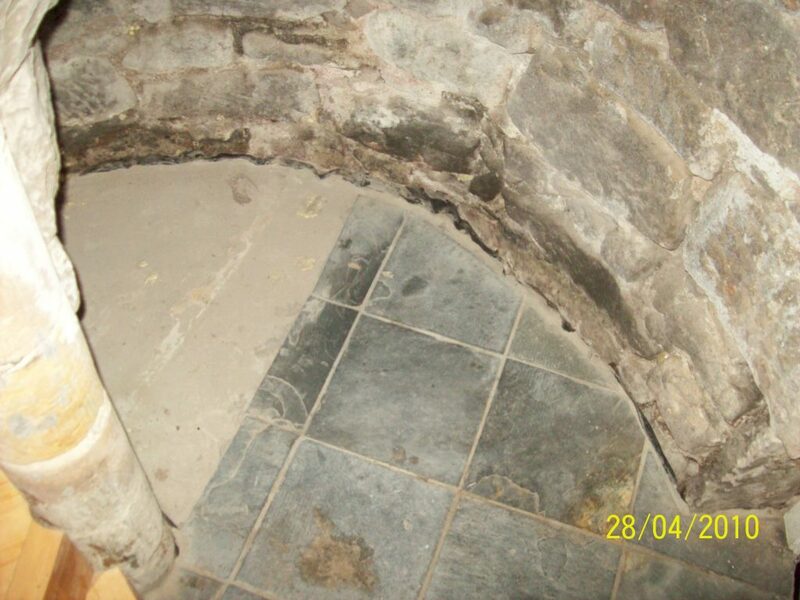 You can see from the photograph below that the tiles how bad that smoke damage was. When we arrived work had already started to strip out the electric shower and screen removing a strip of tiles in the process. 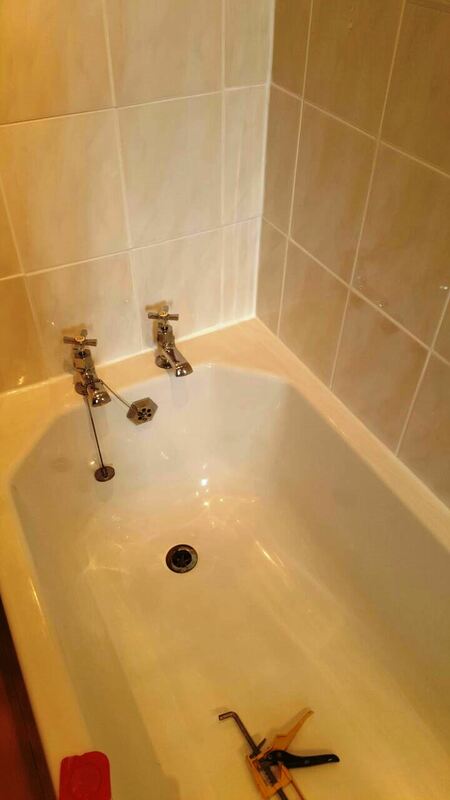 It was also clear that someone had also attempted to clean the ceramic tile and grout but had given up after realising how much work was needed. 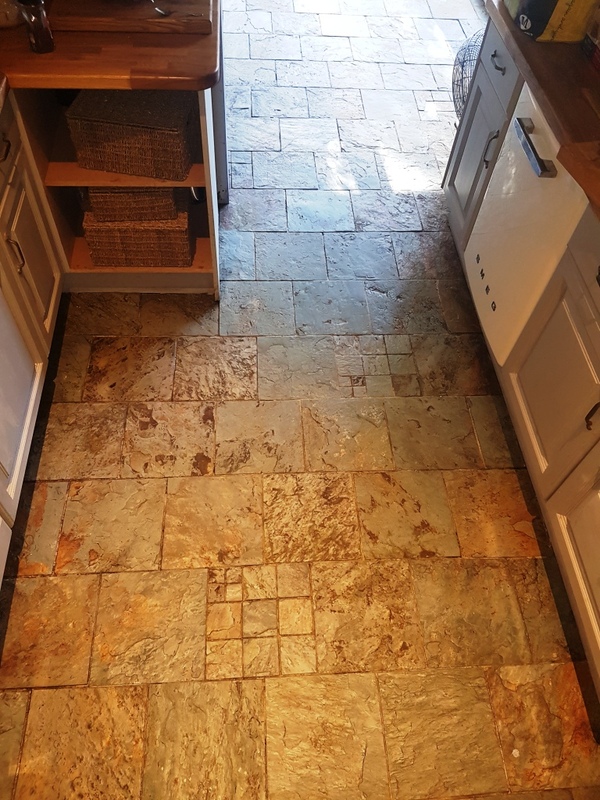 We had to give the tile and grout several deep cleans using a strong dilution of Tile Doctor Pro-Clean which was sprayed on, left to dwell for a while and then scrubbed in by hand. On reflection Oxy-Gel might have been a better product for the job as it has the same active ingredients but comes in a gel form which allows it to stick to vertical surfaces resulting in longer dwell times. 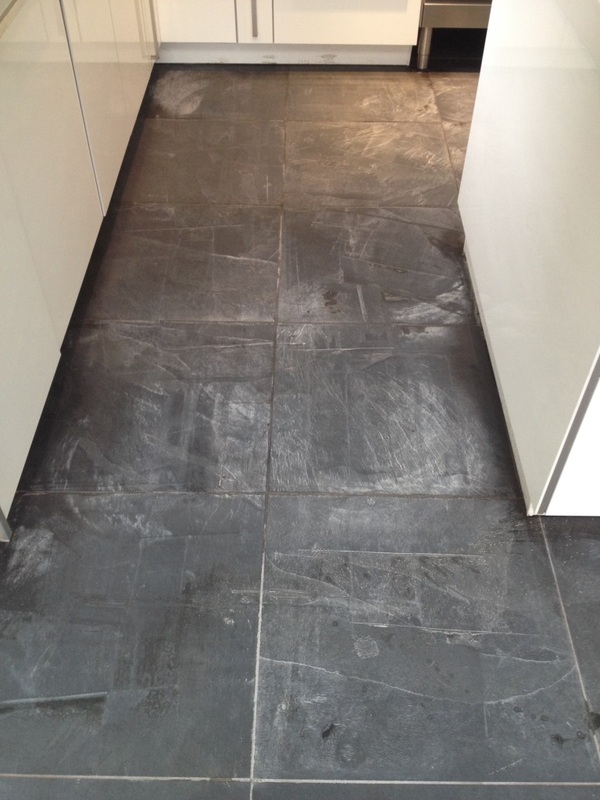 We managed to successfully remove all the smoke and soot from the surface of the tile and grout with this process. However although the grout was now clean I could see it was going to need more work if it was going to pass muster. To overcome the grout issue I decided to colour it with a White grout colourant; this was a perfect time to apply the colourant as the Pro-Clean had prepared the grout joints and would make a good bond with the colourant. I used three coats of white grout colourant in the end, each one applied by hand with a small brush. The colourant is basically painted on top of the existing grout and any excess wiped off the adjacent tile before it dries. It’s an epoxy based formula that becomes a long-lasting barrier protecting the grout and making it much easier to clean. Following this I cleaned the tiles down again, this time with Neutral Tile Cleaner and then turned my attention to the stained silicone sealant around the base of the shower tray which was cut out and replaced with fresh new white silicone. 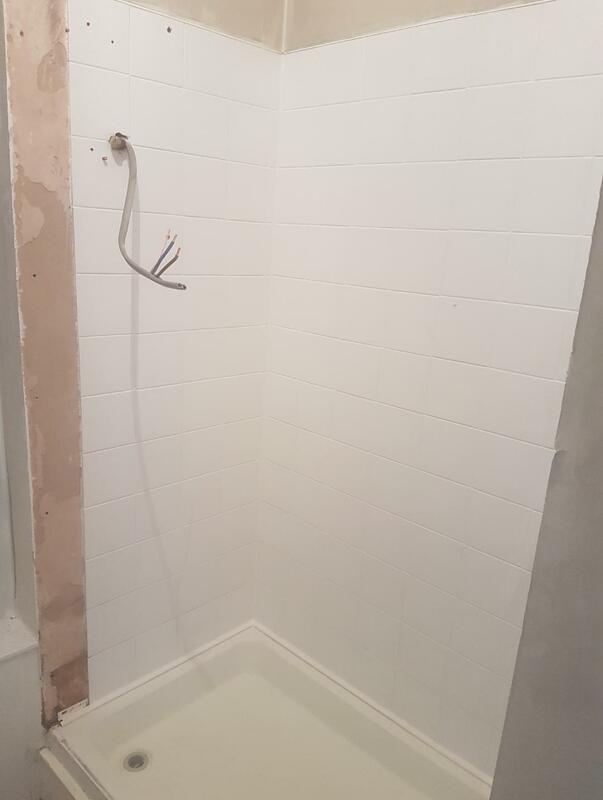 I gave the shower tray a clean as well and the final result was a very fresh looking shower cubicle which will soon back in action once the other trades finish their installations. This bathtub with shower over was at a house in the old shipbuilding port of Greenock within the historic county of Renfrewshire. I’m not sure you can appreciate it from the before photograph below, but the grout was white and was starting to discolour. The owner of the house didn’t want it to get any worse and asked us for help. 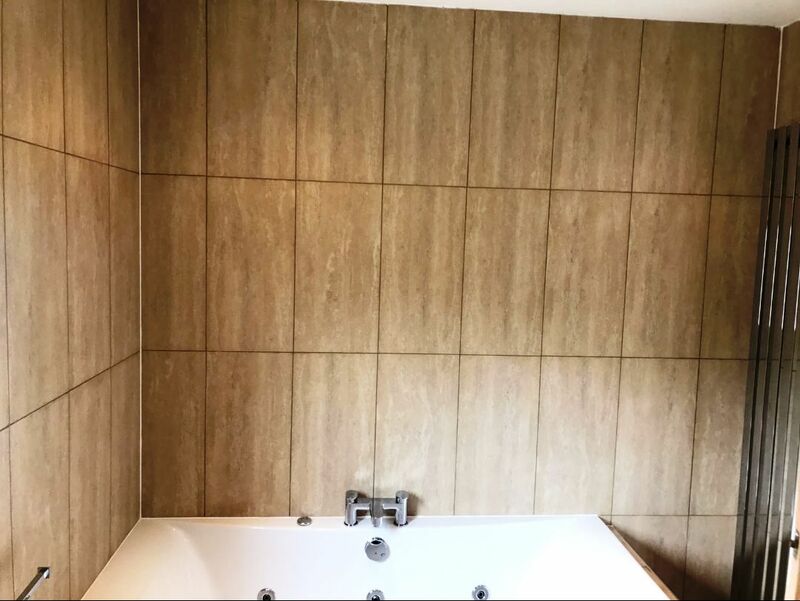 We discussed the options and the benefits of applying a grout colour which would not only change the colour but also add a layer of protection over the grout which would be much easier to keep clean going forward. With the decision made we set about cleaning the grout first with a Grout Colourant Pre-Treater that cleans and etches the grout resulting in a better bond with the grout colourant. This was followed by rinsing the grout with water to remove any dirt and remove the traces of pre-treater before drying it off with a heat gun ready for the next step. The customer had decided on a Chocolate grout colour, so it would blend in with the brown tiles more effectively. So, once the grout has dried two coats of Tile Doctor Grout Colourant were applied over the grout with a small brush. This product is basically painted on top of the existing grout any any excess wiped off the adjacent tile before it dries. It’s an epoxy based formula that becomes a long-lasting barrier protecting the grout and as I mention before making it much easier to clean. Last step before leaving was to strip out the stained silicone sealant between the top of the bath and tile and replaced with fresh new white silicone to match with the white bathroom suite. The job only took a day to complete and the owner was very pleased with the way the tiles now looked. 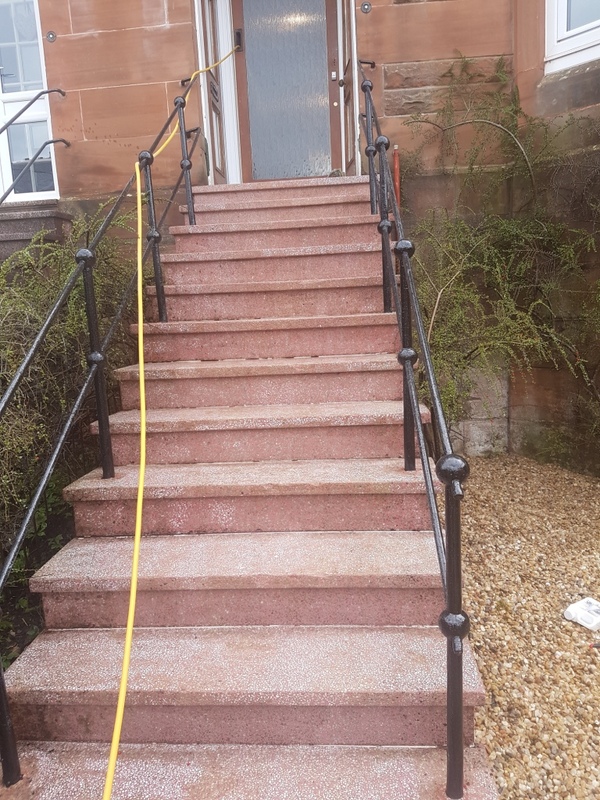 The photographs below are from a set of Terrazzo steps outside a house in Glasgow which had completely lost their colour after being subject to years of weather staining and believe me we see all sorts of weather up here in Scotland. The owner of the house wanted them restoring back to their natural state but naturally concerned about safety didn’t want them shiny or slippy in anyway. 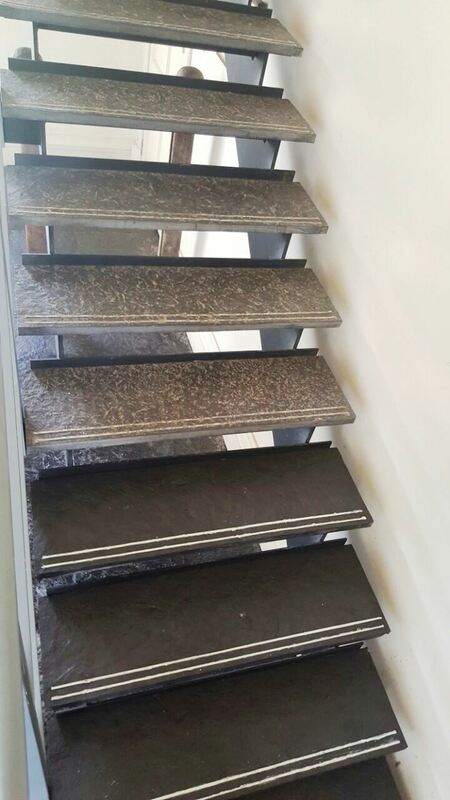 I could see tackling the different surfaces of the stone stairs would be tricky so rather than opt for a cleaning product I decided to use a set of diamond encrusted burnishing pad fitted to a handheld flex machine. I started with the very coarse 50 grit pad lubricating along the way with a little water and moved up through the medium and fine pad until the job was finished. Now normally when working on stone this is followed up with the application of a very fine pad to restore a polished appearance but clearly in this case that would not be necessary. In between the application of each pad the steps were rinsed with water to remove the slurry generated in the burnishing process. One complete I left them to dry out for a few days; fortunately I had timed my visit within a warm weather window so I was confident they should be dry when I returned. 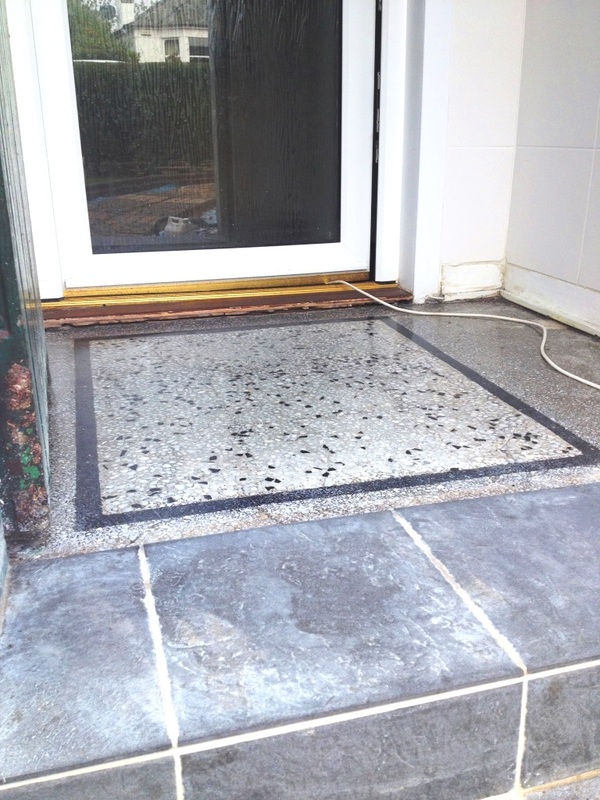 I returned a few days later and after checking the stone had indeed dried out I sealed the Terrazzo with three coats of Tile Doctor Colour Grow which is a breathable impregnating sealer suitable for external application. Being an impregnator it protects the stone from within by occupying the pores in the stone where dirt might otherwise become ingrained, it also enhances the natural colours in the stone and as you can see from the photograph below the steps now look much pinker. 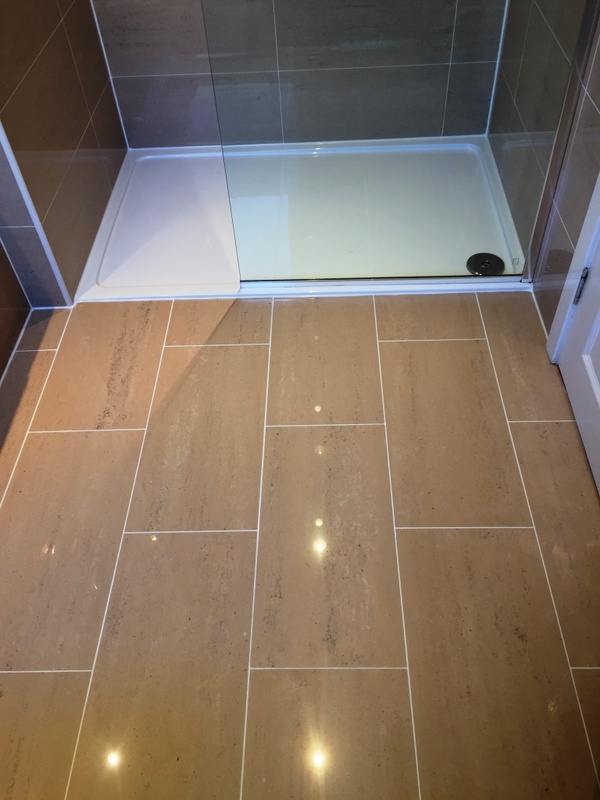 The photographs below are from a 55m2 Porcelain tiled floor that we worked on recently at a house in the town of Bearsden which is an affluent suburb of Glasgow. 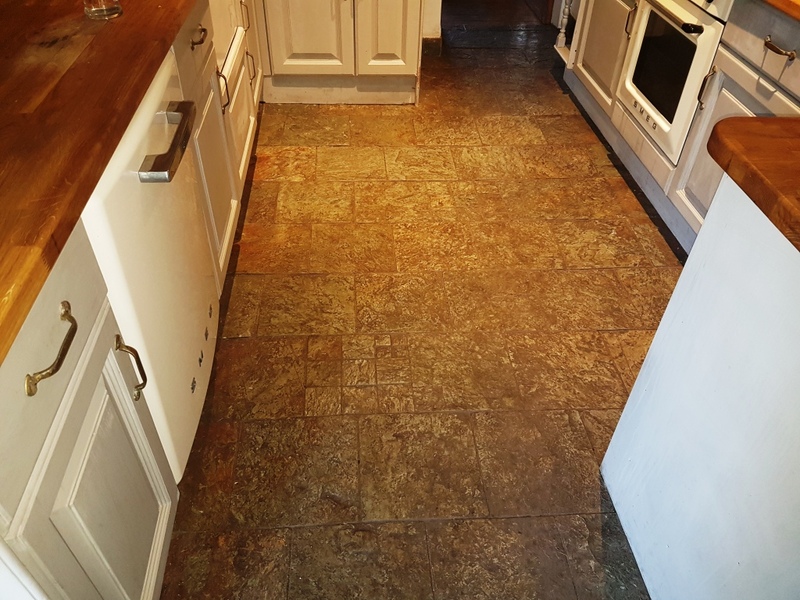 The floor was laid well with large format tiles which were in good condition however like most floors the grout had become stained and was now patchy and inconstant in appearance. The owner of the property thought we may need to replace the grout however I was confident we could resolve the problem without having to resort to that. To get the tile and grout clean a strong dilution of Tile Doctor Pro-Clean was applied to the floor and grout lines and left to soak in for ten minutes. 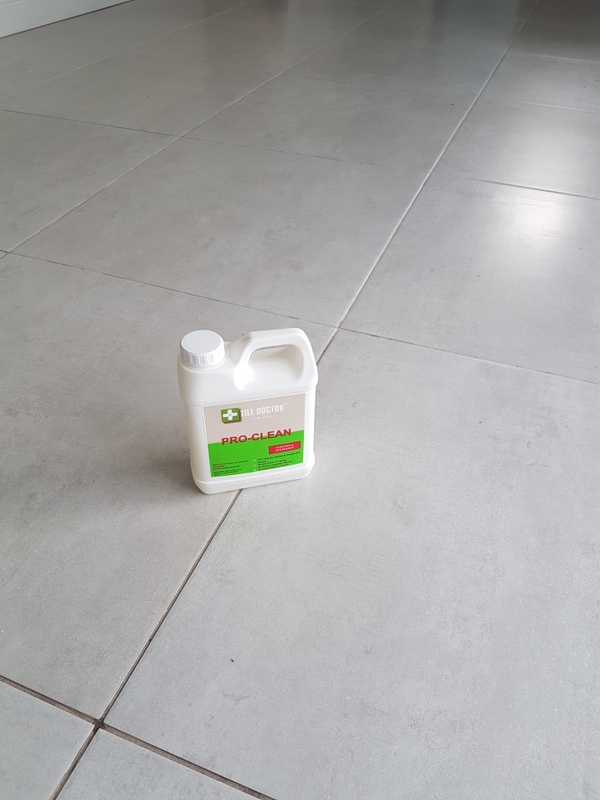 Pro-Clean is an effective tile and grout cleaner that has a strong alkaline formula so it’s safe to use on all types of tiled floors including natural stone. 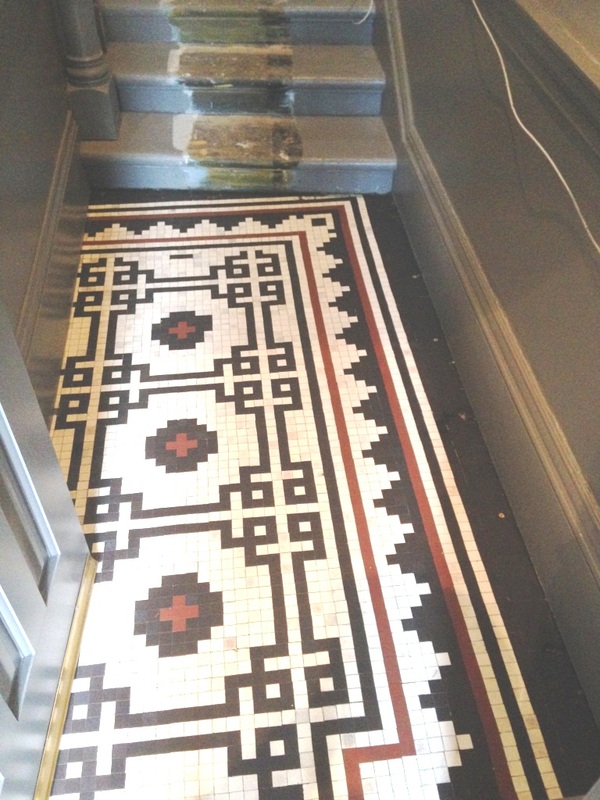 The solution was then scrubbed in with a rotary machine fitted with a black scrubbing pad and the recessed grout lines were scrubbed by hand using a narrow stiff brush. 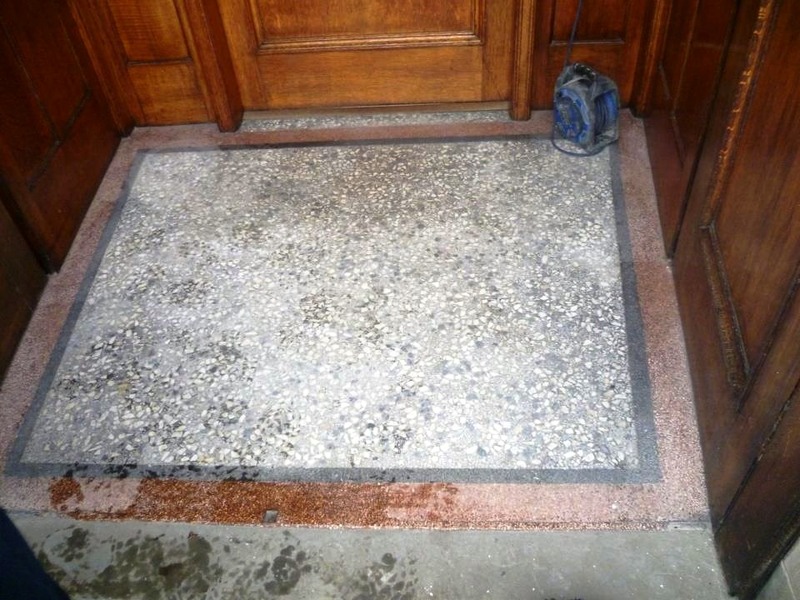 Once this was completed the floor was rinsed with water and the now soiled cleaning solution extracted with wet vacuum. 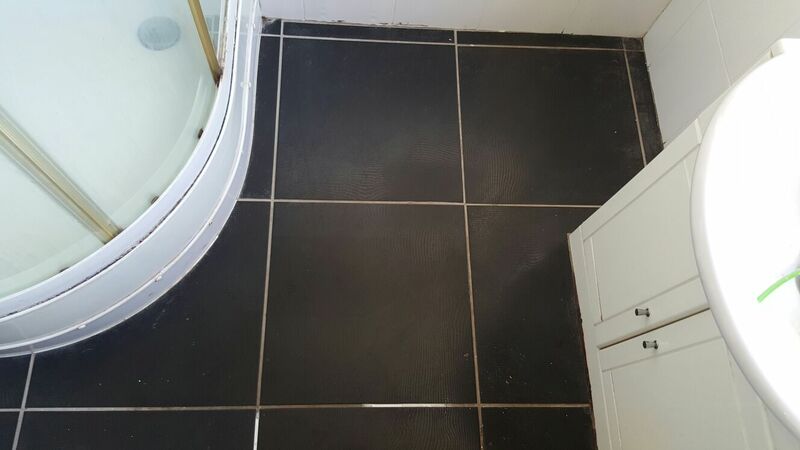 This cleaned up the tiles nicely and also the grout, however although improved some of the grout was still discoloured and inconstant in appearance so I recommended we apply a grout colourant which would fully restore the appearance. 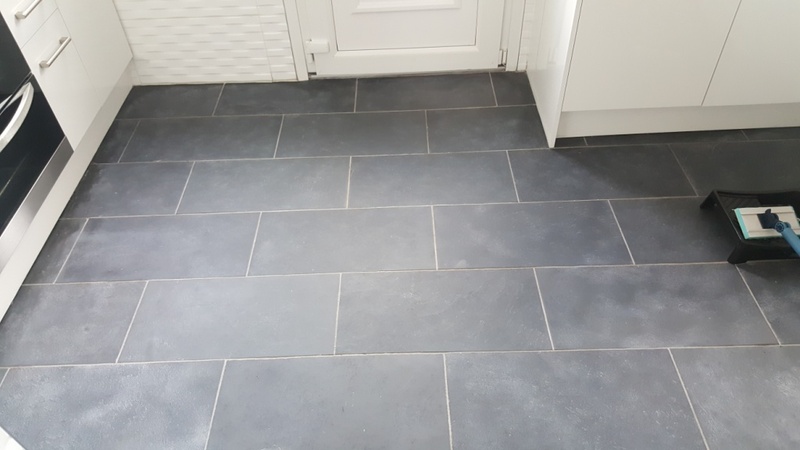 I let the floor dry off completely following the clean before applying a Light Grey grout colourant, one of the ten different types of grout colourant we offer, which seals and rejuvenates the grout joints. Other colours include White, Black, and Cappuccino. The colourant is applied using a small brush and then you wipe off any excess that gets on the tile before it gets chance to dry. It’s a laborious process however it was made easier by the large format tiles which meant there was less grout to apply the colourant too than usual. As you can see the grout nows looks much neater and cleaner, also the epoxy formula of the colourant adds a barrier over the surface of the grout that will protect it from future discolouration and make it much easier to clean. Kitchen tiles are never the easiest to keep clean. Food and drink spillages are likely to happen on a daily basis, especially if you live in a busy household. Not to mention the dirt and dust that builds up over time if the tiles are not treated to regular cleaning and maintenance. 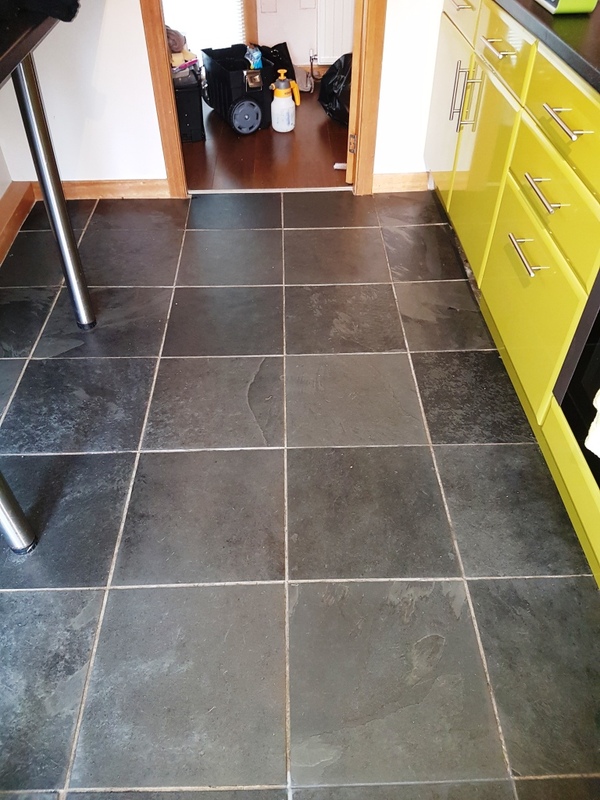 At this house in Linwood, a small town about 14 miles west of Glasgow, the Slate tiled kitchen floor, measuring approximately 8-10 square metres, wasn’t in a great state. In particular, the grout was very noticeably stained. The property owner called me to help bring the floor back to looking it’s best again. I started the restoration by cleaning the tiles and grout with Tile Doctor Neutral Tile Cleaner. This pH neutral cleaner is specially formulated for the regular cleaning of natural stone, unlike many supermarket-grade cleaners that are only really suitable for use on ceramics. 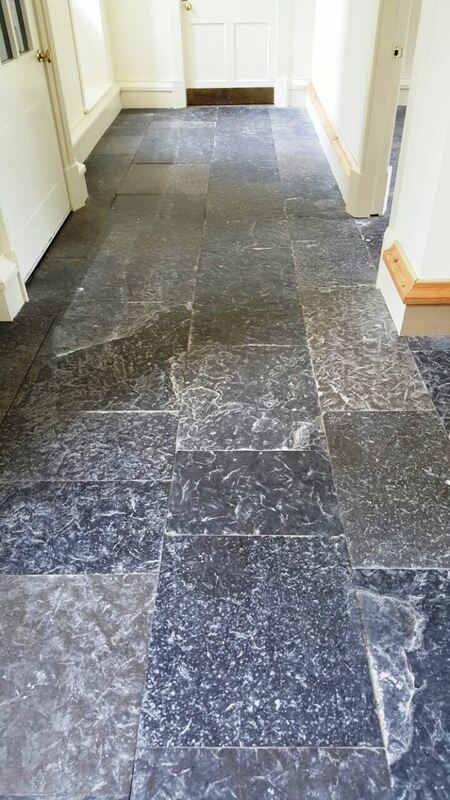 The customer was also wary about the sealer on the Slate tiles being damaged, so I didn’t want to use anything stronger or acidic. 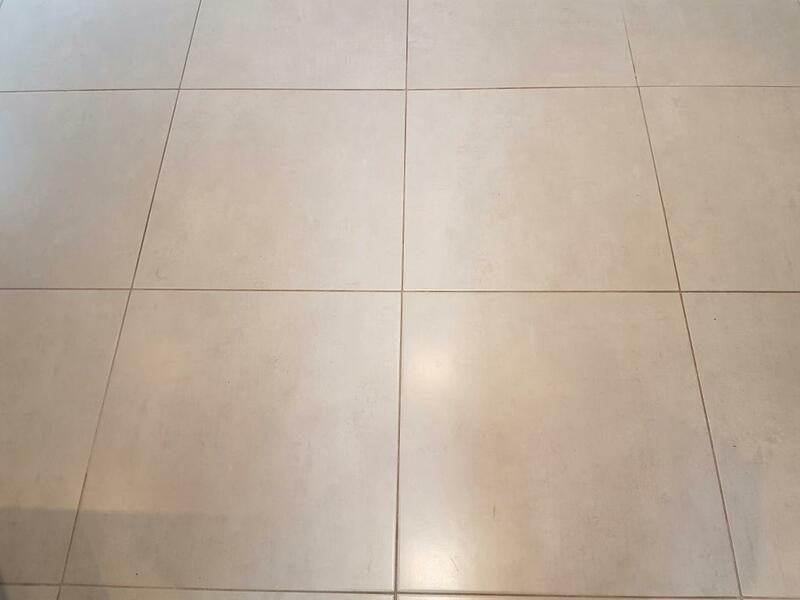 Nonetheless, the Neutral Tile Cleaner did a fine job of removing any muck from the surface of the tiles and removing the stains from the grout. 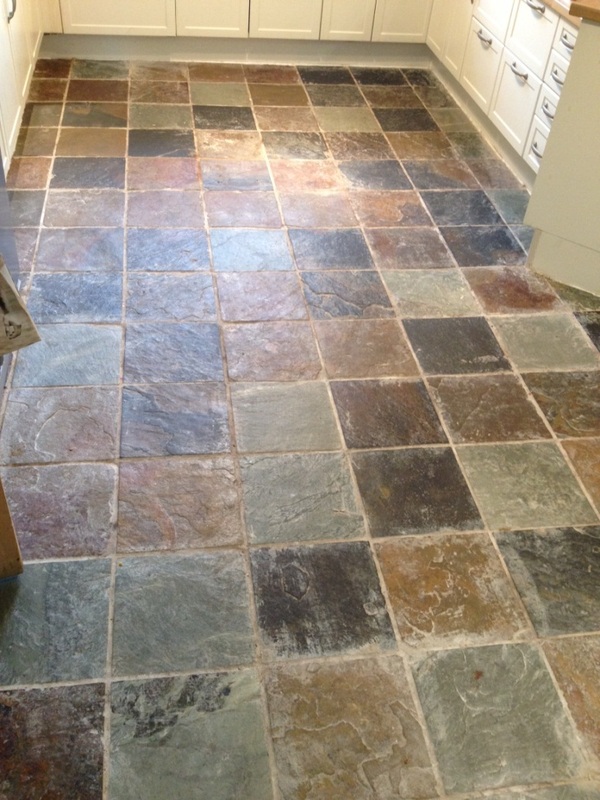 I also recommended that the grout be recoloured in order to fully restore the appearance of the floor as a whole. 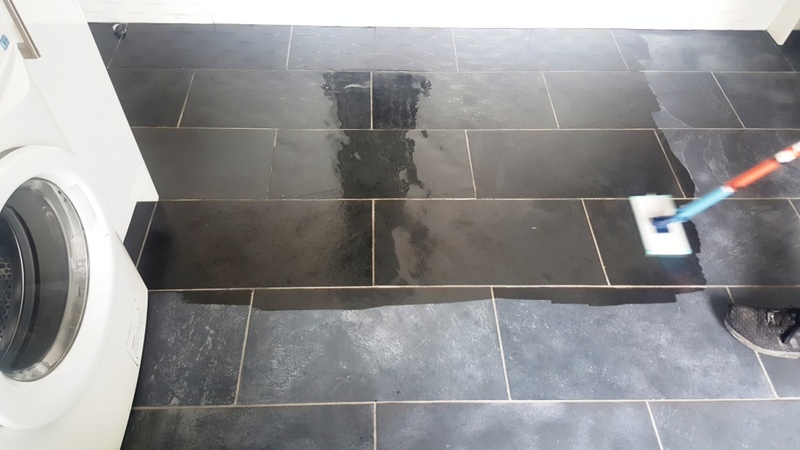 I let the floor dry off completely following the clean, before applying our Natural Grey grout colourant, one of the ten different types of grout colourant we offer, which seals and rejuvenates the grout joints. Other colours include White, Black, and Cappuccino. In this case, I felt Natural Grey would match in best with the natural colours of the Slate. I then left the grout to dry before polishing off any excess colourant. On rare occasions we encounter extremely dirty tiled floors which have clearly not been cleaned for months, or even years. 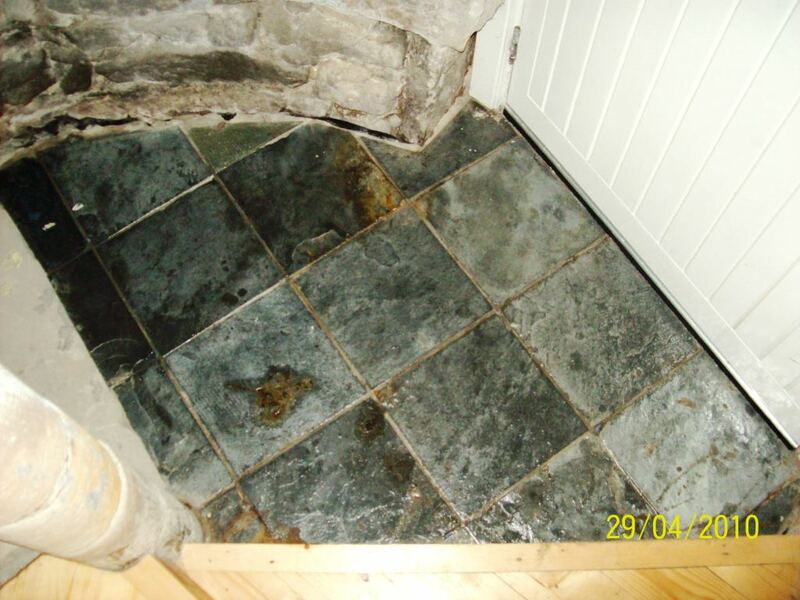 As you can see from the first photograph, this Slate tiled floor at a property in Gateside is an example of one of these extreme cases, being completely caked in thick layers of dirt that had amassed over a long time. 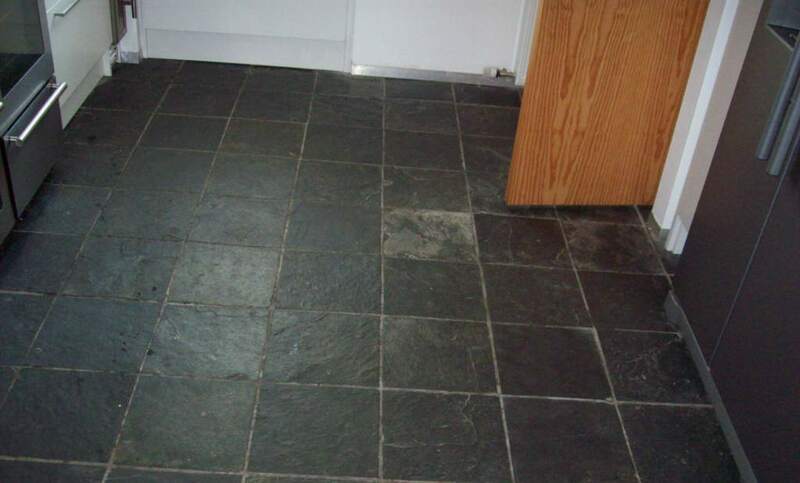 While Slate is typically more hard wearing and rougher in texture many other types of tile, this doesn’t mean that it requires less frequent maintenance. 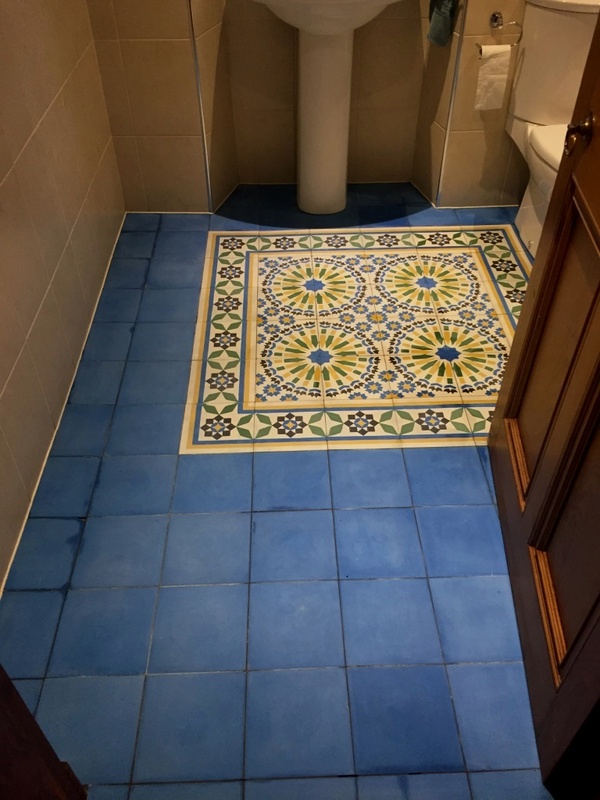 With the floor measuring in at 20×20 metres, getting the tiles back to looking their best would be a big job, and certainly one that required the attention of a professional. 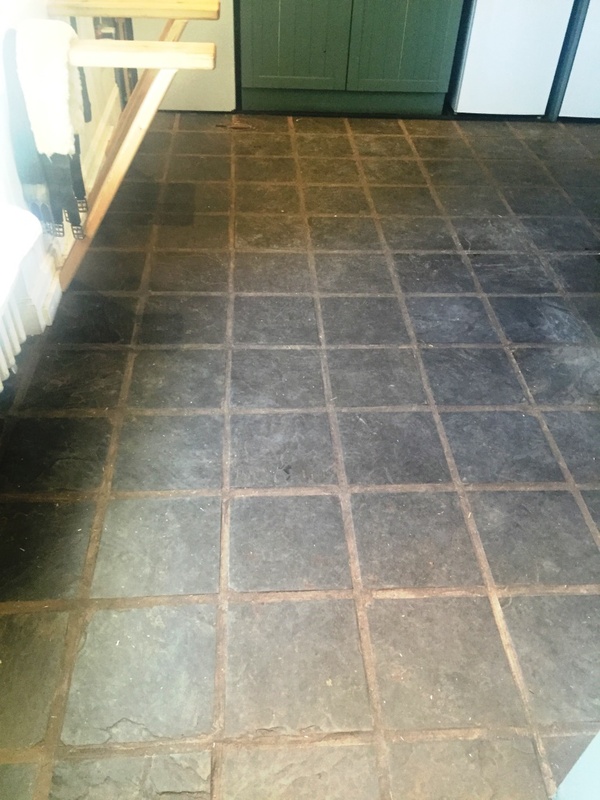 As the tiles were exceptionally dirty, I applied a strong dilution of our alkaline cleaner, Tile Doctor Pro Clean, which can be used for both light soil buildup and very heavy soil buildup. After applying the product, I left it to dwell for a healthy period to allow it to break down the thick layers of dirt. I then used a black scrubbing pad fixed to a heavy rotary machine to scrub the tiles, extracting the resulting slurry using a wet vac machine. Due to how dirty the tiles were, I repeated this process several times until satisfied that the tiles were as clean as possible. Next, I paid attention to the grout, cleaning it by hand, again using Pro Clean. Once this was completed, I rinsed the floor a few times with clean water to remove any trace of chemical. I was keen to seal the floor the following day, so I installed a fan overnight to speed up the drying process. As many will already know, a tiled floor cannot be sealed until it is completely dry, or else the excess moisture will cloud the sealer. Upon my return to the property the next morning, I used Tile Doctor High Shine to seal the floor as requested by the customer. This sealer is specifically designed for use on textured natural stone such as Slate, providing a durable, resistant and high shine surface seal. I applied four coats in total. The customer wasn’t at home when I finished the job, but he sent me a text later in the day to say just how impressed he was with the transformation of the floor. Another satisfied customer! 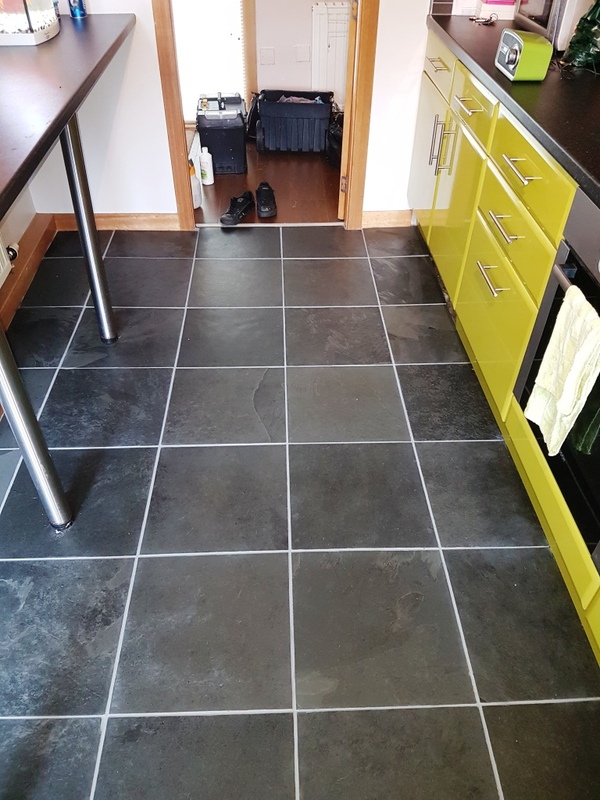 This customer, who lives in Paisley, one of Scotland’s biggest towns – and one with a rich history in the textiles industry – had not been completely satisfied with her Slate tiled kitchen floor since it had been laid. 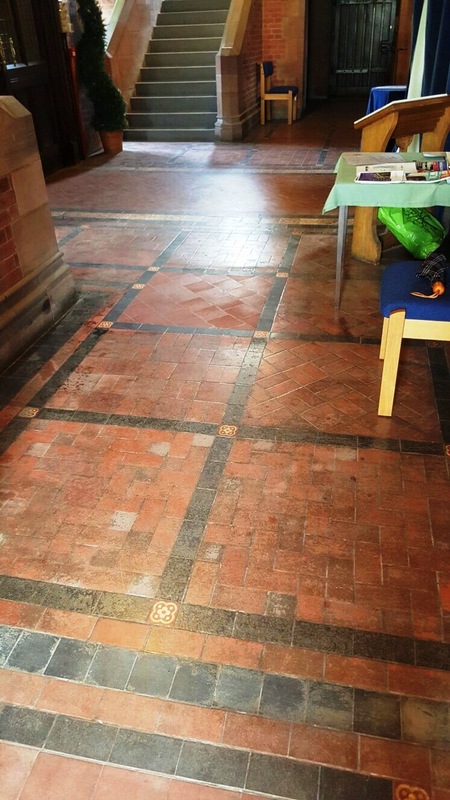 Having only been laid recently, the tiles themselves were in good shape, but they lacked the aesthetic quality desired by the customer. 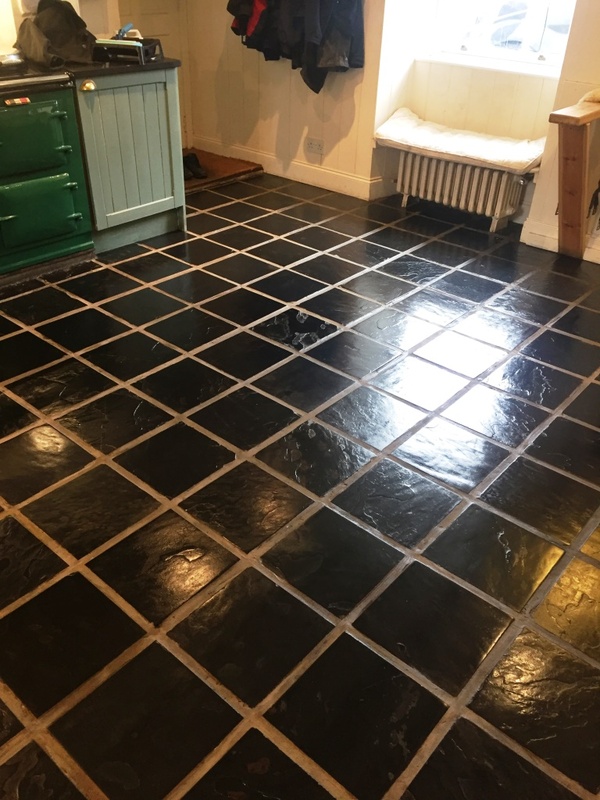 She wanted them to be a richer, darker black in colour while keeping the matte look – as she had seen advertised in the tile shop – but once laid the tiles had been left looking rather unexceptional. The floor area itself was only small (at around 12 metres squared), and I was confident I could have it looking much nicer in no time at all using the right products. To begin, I stripped away any previous sealer using a diluted mixture of Tile Doctor Pro Clean and Tile Doctor Remove and Go scrubbed into the tiles. This also helped to remove and bits of dirt and dust left on the floor. 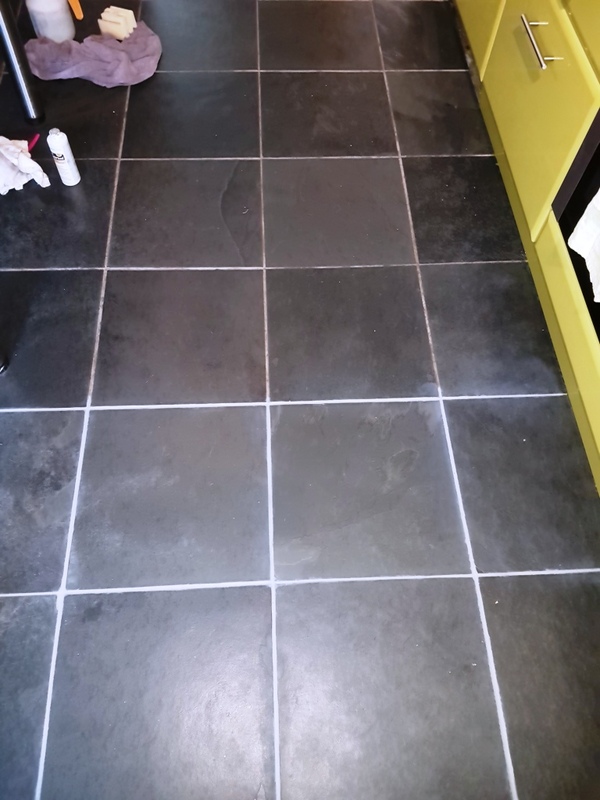 While the tiles, as mentioned, were in relatively good nick, I wanted to get the floor as clean as possible before giving it a fresh seal and my chosen combination of products did not let me down. 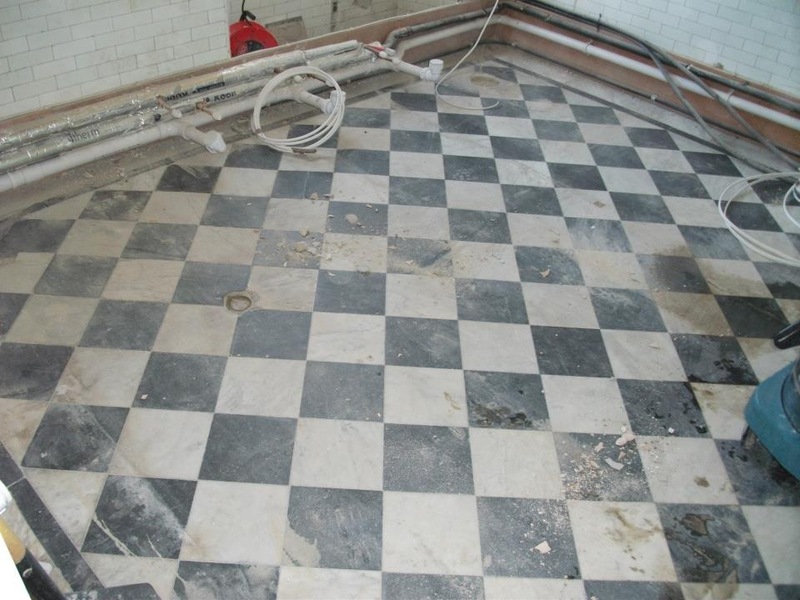 The floor was then neutralised with clean water, removing any outstanding cleaning chemicals, and the resulting cleaning slurry was promptly removed using a wet-vac machine. To finish the clean, I washed the tiles in pH Neutral Tile Cleaner, leaving it fresh and ready to be sealed. 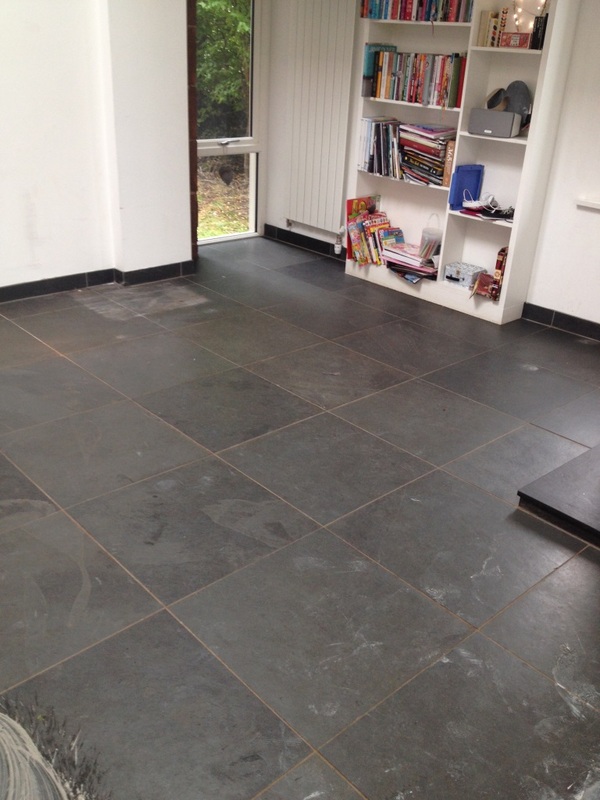 The next day I returned to the property to seal the Slate tiles making sure first that the tiles were dry. 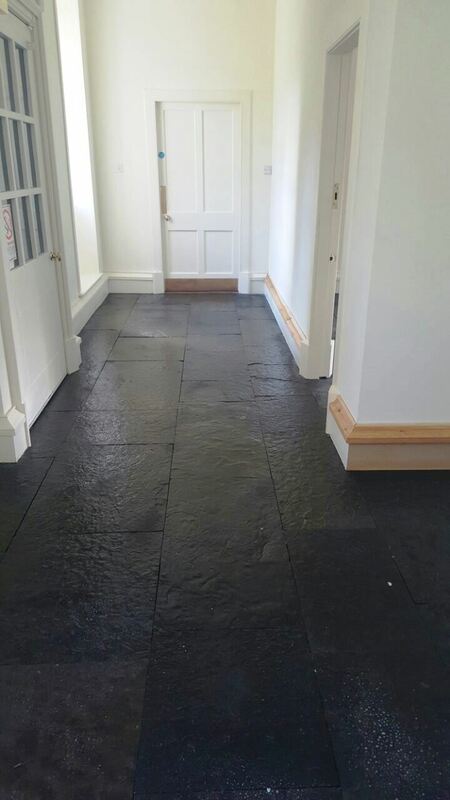 To restore the colour and texture of the Slate I started with an application of Tile Doctor Stone Oil which impregnates the pores of the stone and like a sealer provides a barrier to ingrained dirt once cured. To maintain the matt finish, as requested by the customer, I added a coat of Tile Doctor Ultra Seal. Just looking at the before and after photographs it’s clear to see that the customer got that the exact result she had requested. 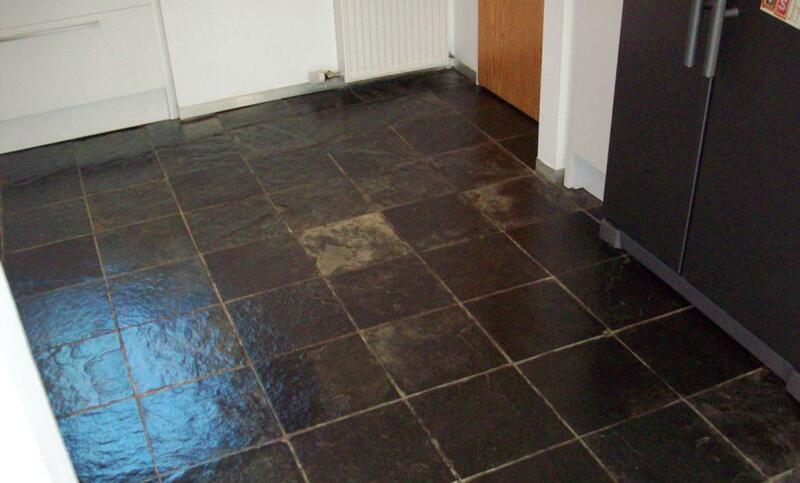 Stone Oil worked wonders to restore the rich, dark tones to the Slate that had been so sorely lacking previously. 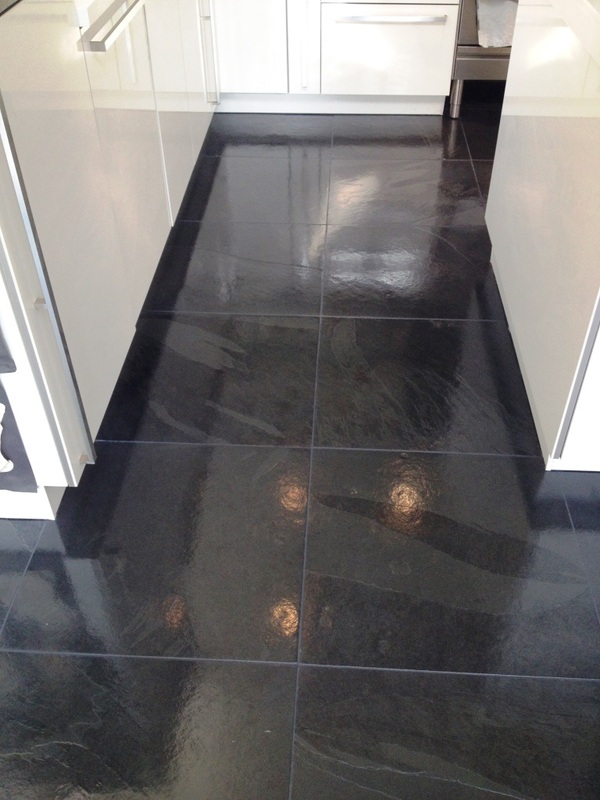 The customer can also be assured that the sealer will be keep the floor easy to clean for a long time to come. 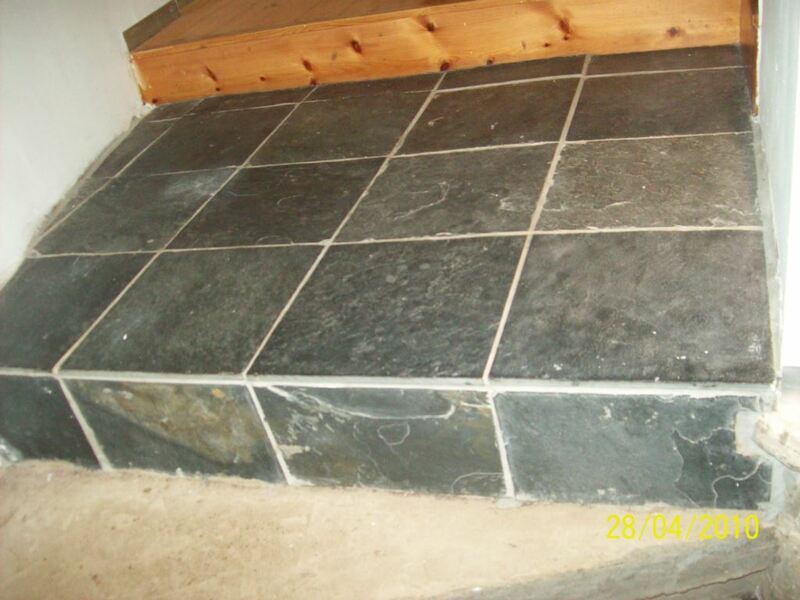 These photographs of a Slate tiled kitchen floor are from a house in Lochwinnoch in the west central Lowlands of Scotland. 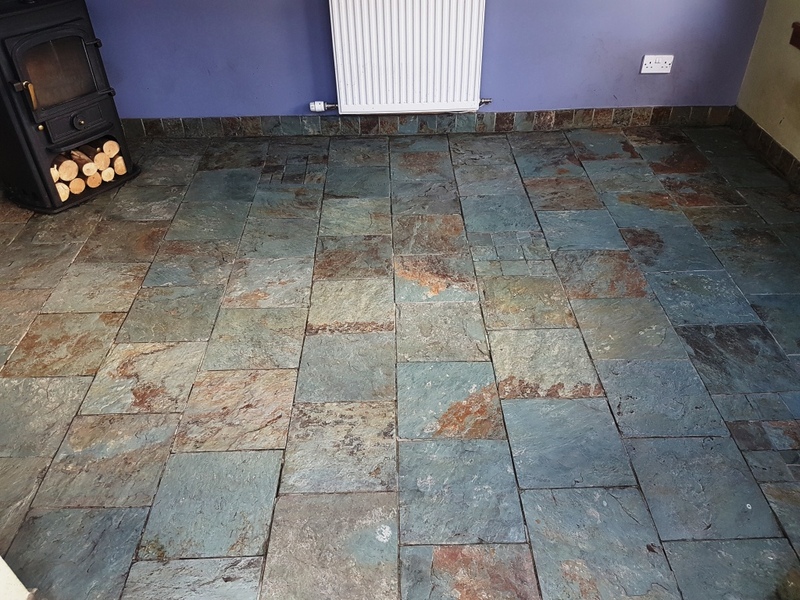 You can see that the slate and grout was looking very dull and any sealer that was present had failed leaving the stone in need of a deep clean and re-seal. 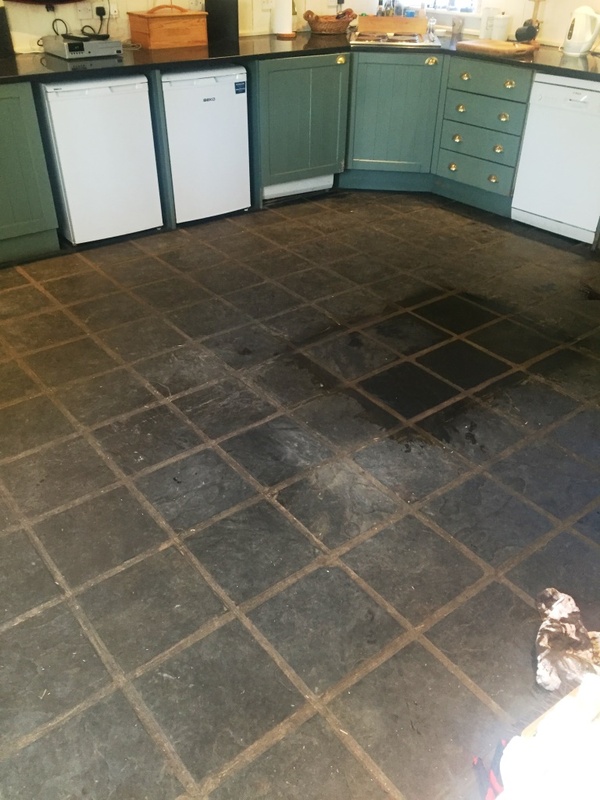 On the first day we stripped the floor of any remaining sealer using Tile Doctor Pro-Clean mixed 50/50 with Remove and Go, this was left to dwell for 5-10mins before scrubbing it in with a scrubbing pad and then extracting the slurry with a wet vacuum. It was important to ensure all the sealer was removed in order to get an even finish and to avoid any compatibility issues when re-sealing later. After this we focused on cleaning the grout using more Pro-Clean this time worked in using a stiff grout brush by hand. Once done the floor was given a thorough rinse using a diluted solution of Tile Doctor Neutral Clean to remove any trace of cleaning solutions that may impact the sealer and again using the wet vacuum to get the floor as dry as possible. 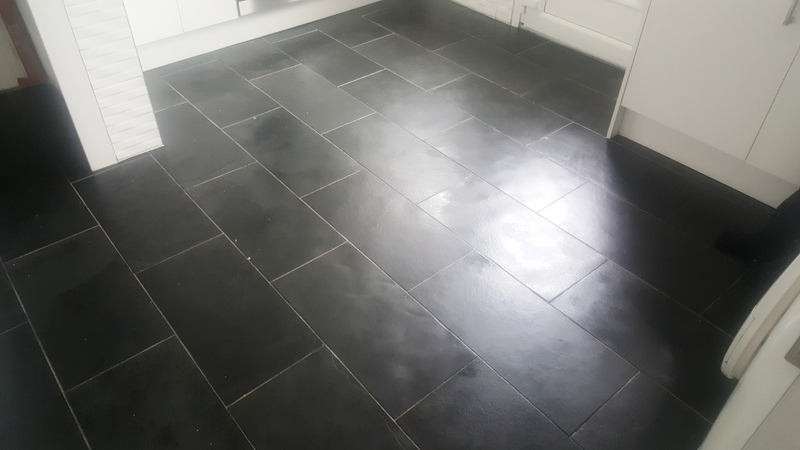 The floor was left to dry off overnight and then we returned on the second day to seal the slate with Tile Doctor Seal and Go which is a water based sealer (no smell) which adds a nice sheen to the tile and gave the desired finish. 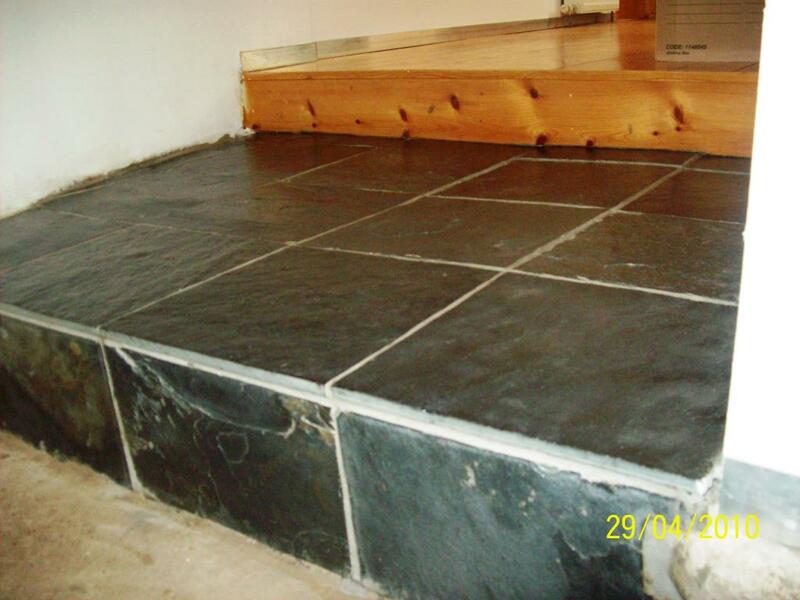 Slate is quite porous so five coats of Seal and Go were required to ensure the floor was fully sealed. To clean grout we normally recommend a good scrub with Tile Doctor Pro-Clean which is an strong alkaline product, in some cases however the staining cannot be removed completely and the only thing your can do with the exception of re-grouting is to re-colour the grout with a Grout Colourant which are available in ten popular colours. 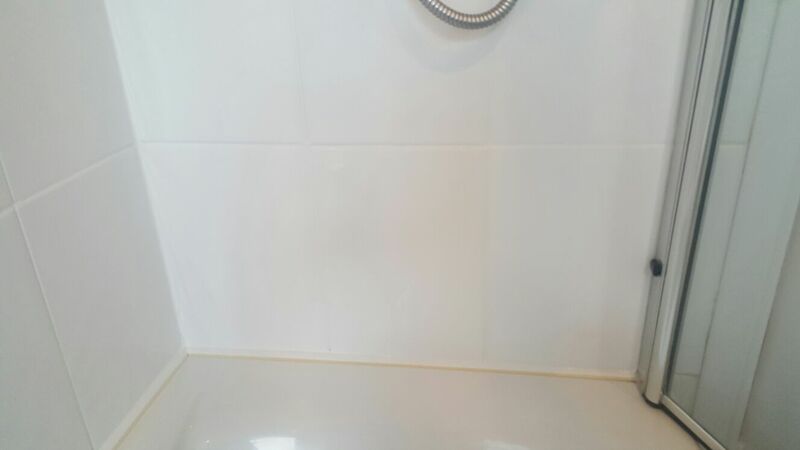 In the case of this bathroom at a house in Paisley near Glasgow both the floor of the bathroom and the shower wall tiles were in need of a refresh and after a review of possible solutions is was agreed the easiest thing to do would be to re-colour the floor grout with a Light Grey colourant and the wall tiles with a White colourant. 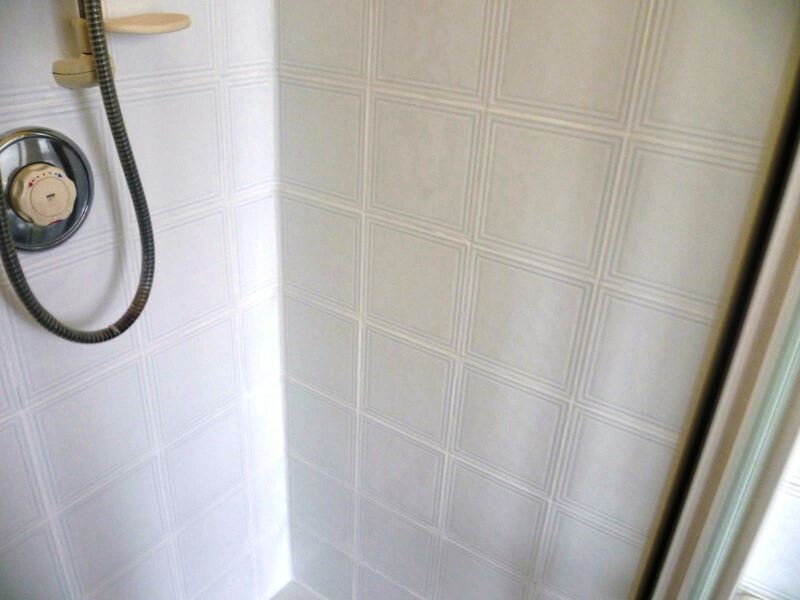 The first step before grout colouring is to give the grout a good scrub with Tile Doctor Pro-Clean to get it as clean as possible before applying the colourant. The grout was then rinsed and then dried ready for the colourant to be applied. You may be surprised to hear but we often find the biggest cause of staining to grout are the dyes contained in soaps and shampoos. Once the grout is ready it’s a straightforward process of applying the colourant evenly along with thin coats along the grout line working the brush backwards and forwards whilst minimising the amount that gets on the tile. We were not changing the colour of the grout substantially so one coat of colourant was sufficient for both sets of tile. 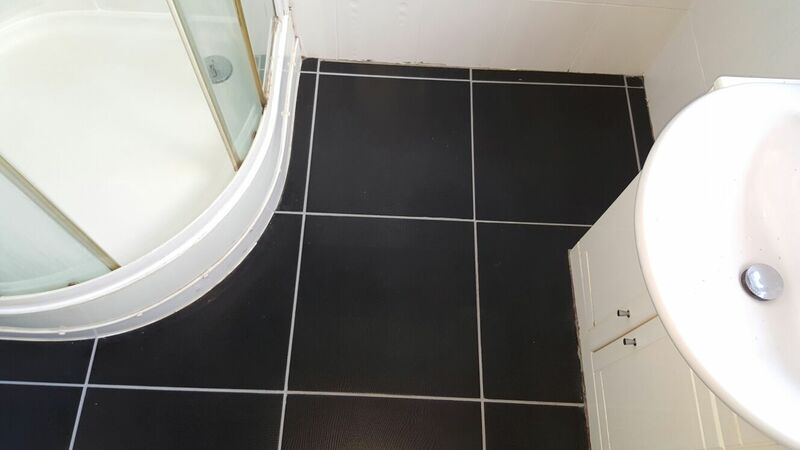 With two colours being applied we were careful to ensure different brushes were used for each job to avoid any contamination and once the job was complete a damp pad was used to remove excess product from the tile surface. As you can see from the photographs the difference was immediate, the other advantage of the colourant is it forms a barrier over the grout protecting it from staining and making it easier to clean going forward. 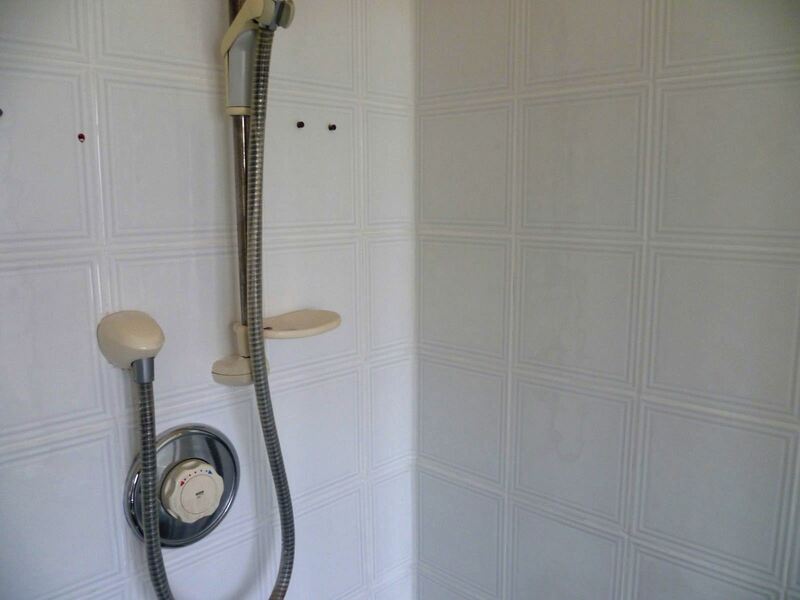 This bathtub with shower over was at a house in the village of Kilmacolm near Greenock. 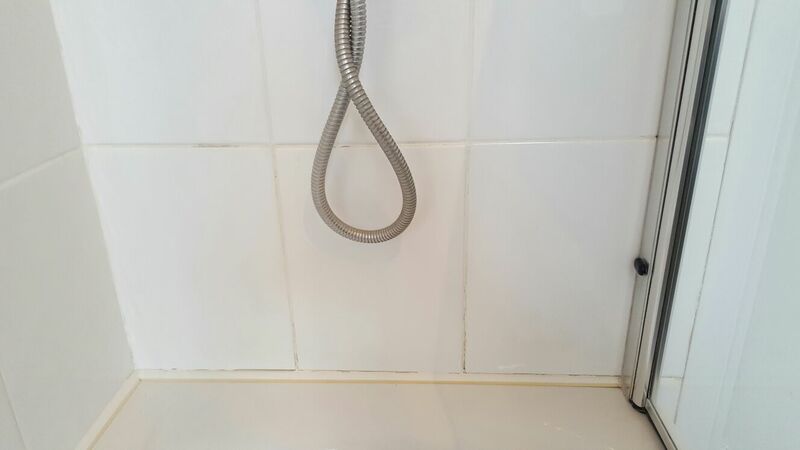 As you can see from the photograph below the grout was stained in places and a tile had become loose behind the taps due to a previous leak causing it to fall out. 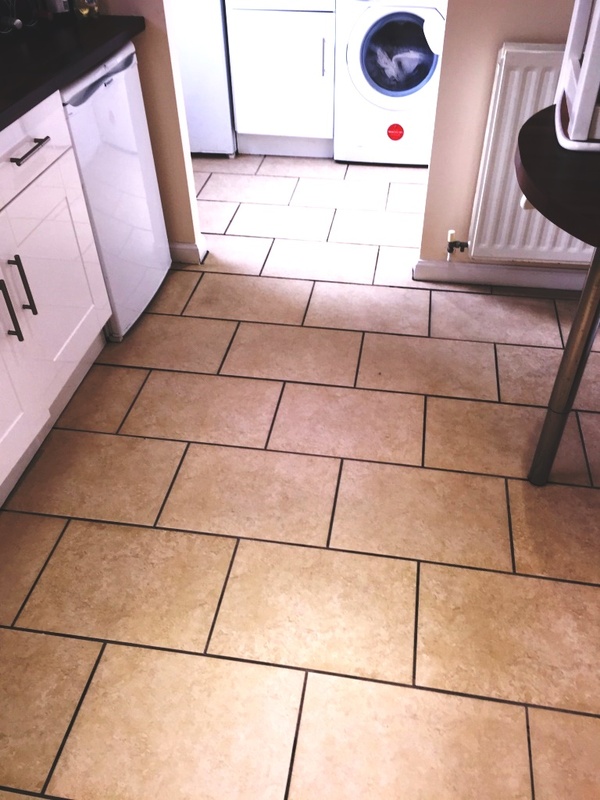 The first job was to put the loose ceramic tile back on the wall, a process involving the scraping off the adhesive and grout from the wall and tile before re-fixing with fresh tile adhesive and the grouting. We placed a blanket in the bathtub during the work to protect it. 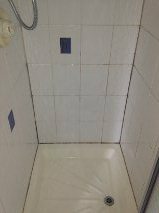 Next the tiles were given a wash down Tile Doctor Pro-Clean with particular attention paid to the grout by scrubbing it with a stiff brush. It was our intention to use a grout colourant on the grout and I wanted to ensure we had a good bond. Whilst the tiles were drying I set about stripping off the old silicone sealant between the bath and the ceramic tiles wall, debris cleared and any remaining sealant was carefully scraped away and then replaced with new silicone. Last step was to apply two coats of white Tile Doctor Grout Colourant, this product is basically painted on top of the existing grout with any excess wiped off the adjacent tile before it dries. 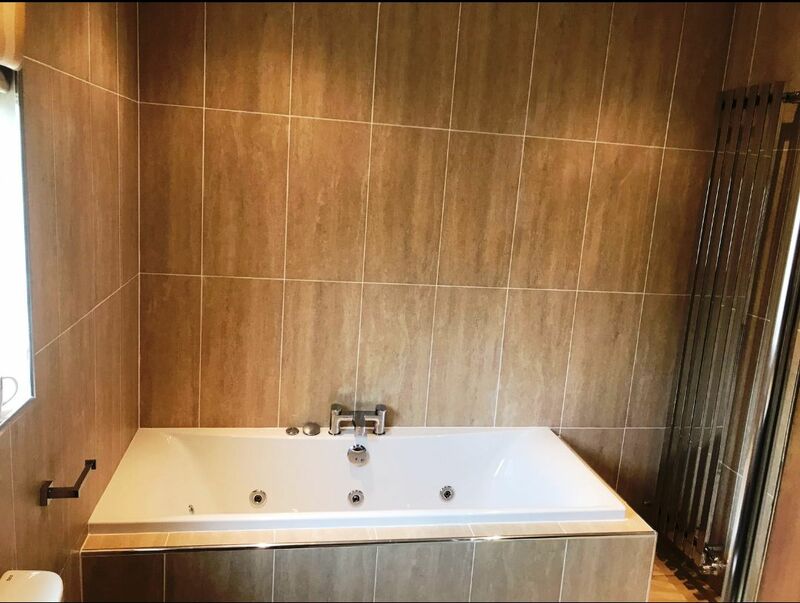 It’s an epoxy based formula that becomes a long lasting barrier protecting the grout and also making it much easier to clean, it looks natural and combined with the new silicone it gave the whole bath surround a real uplift. The job was completed in a day and I think you will agree the whole bath area now looks like a new installation. 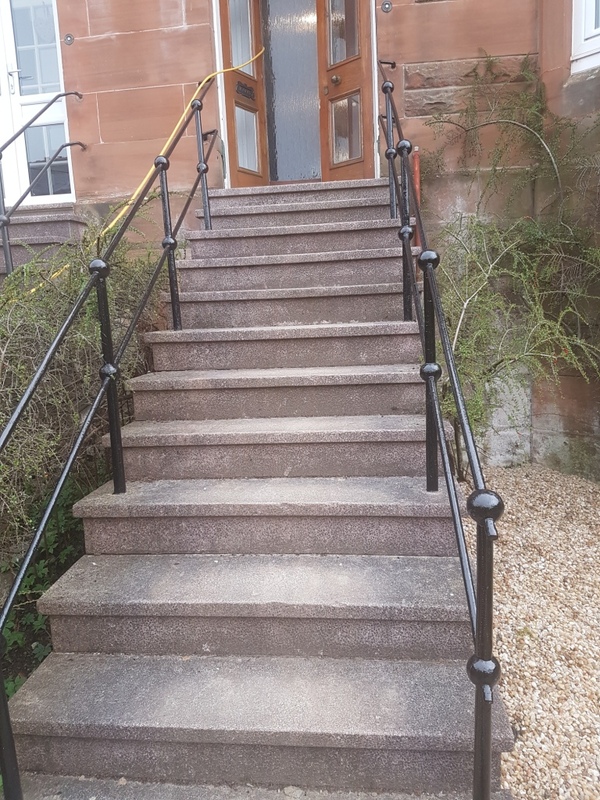 The photographs on this page are of a natural Rough Slate tiled floor installed in the ground floor and stairs of the Touch Business Centre in Stirling where recent building renovation works had left the floor covered in dirt and plaster dust which they couldn’t remove. 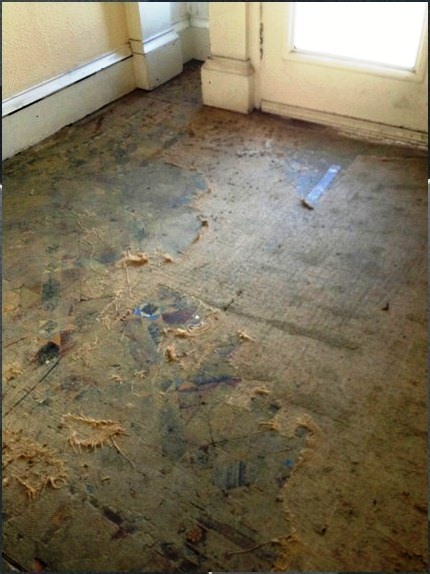 The owner of the business centre now needed the floor renovating prior to renting out the units to new tenants. 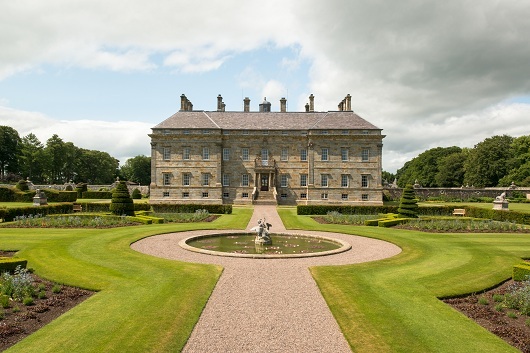 Dating from around 1750 the business units had been converted within the stable block of a large house; now a listed building they would originally have been used for horses and carriages before becoming a milking parlour, estate workshops and garages. 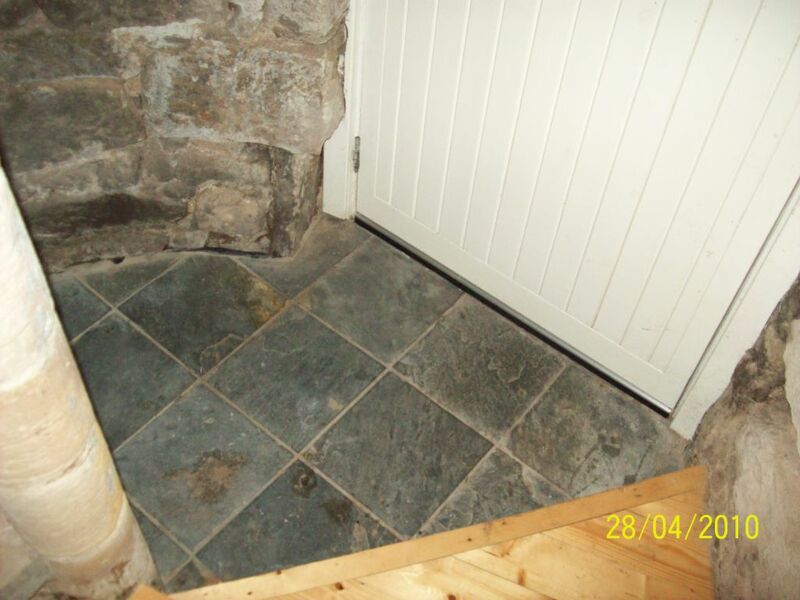 The conversion was supported by Historic Scotland and had to retain the feel and features of an historic building and the slate floor was an important part of this. 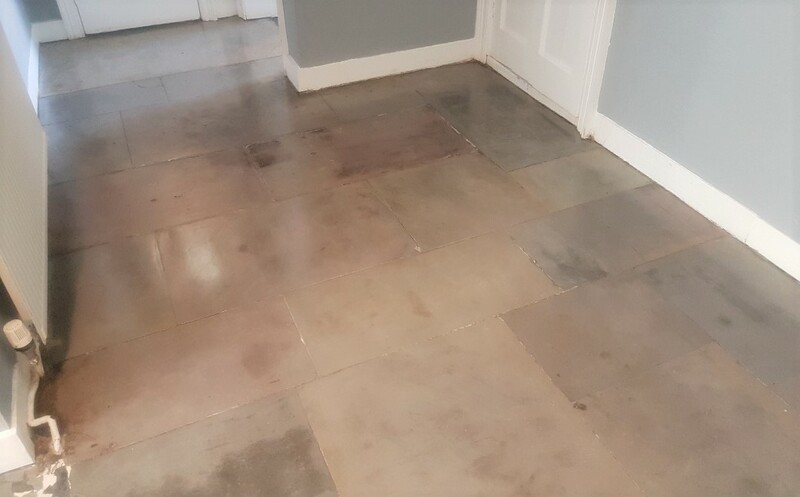 To remove the dirt and plaster we used a dilution of Tile Doctor Remove and Go which is a strong coatings remover that’s safe to use on natural stone but also very effective. It was mopped onto the tile and left for around twenty minutes to allow it to soak into the pores of the tile and get to work and break down and soften any remaining sealer and plaster etc. 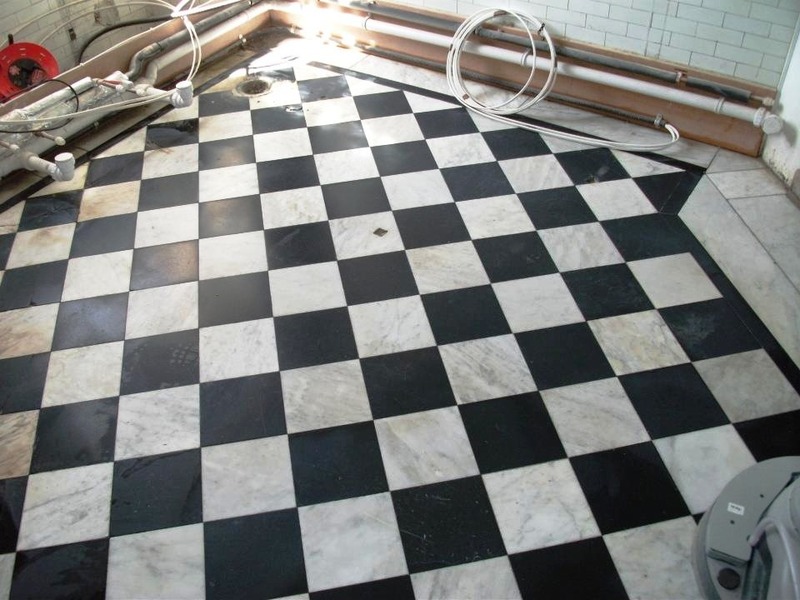 This was then scrubbed into the tiles using a black pad fitted to a rotary machine running on a slow speed; the resultant soiled cleaning solution was then extracted using a wet vacuum, the floor rinsed and the process repeated until we were satisfied the floor was completely clean. 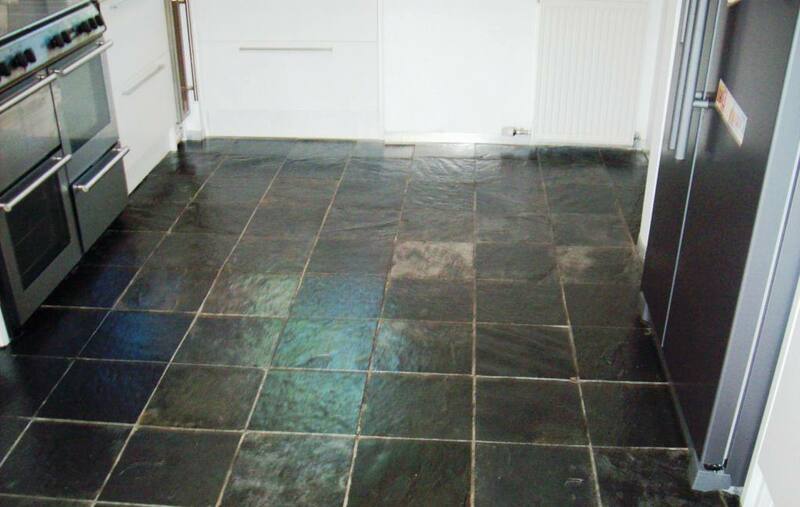 After allowing the floor sufficient time to dry we returned on-site to seal the slate tile and protect it from stains etc checking first with a damp meter that the tiles were indeed dry. To seal the floor we used five coats of Tile Doctor Seal and Go which is a water based sealer (no smell) which adds a nice sheen to the tile and gave the desired finish. 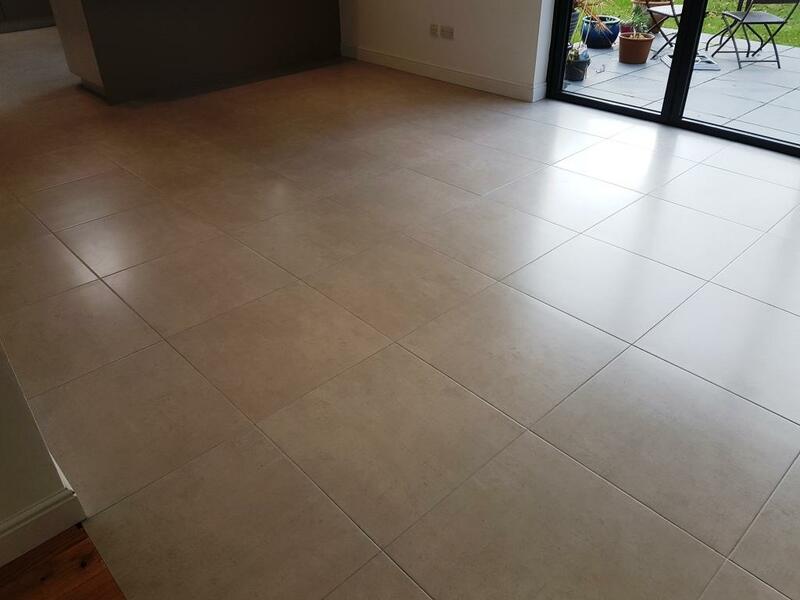 Porcelain tiles are very hard wearing and a great choice for kitchens where they are likely to see a large amount of foot traffic, you do need to be careful however if they are the micro porous porcelain which as the name suggests are slightly porous and can trap dirt and become difficult to clean. The other problem you are likely to have with any tiled floor is the grout which has a porous top layer that can become stained. 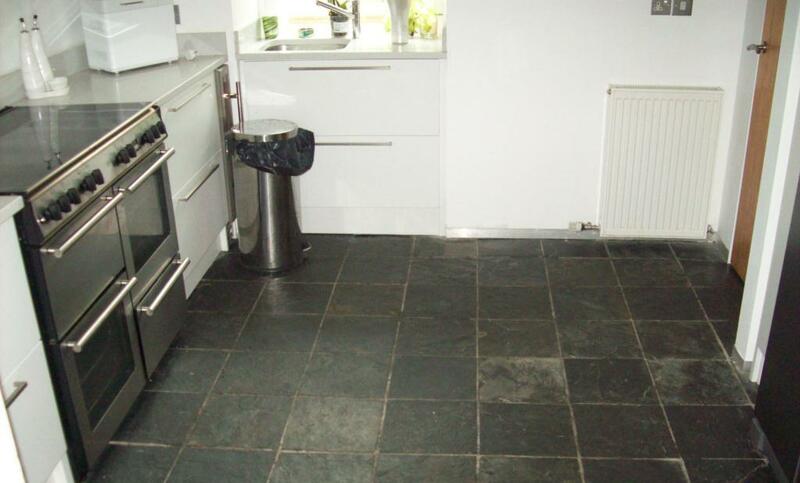 This was the case with the kitchen floor tiles at this house in Glasgow where you can see from the photograph below the improvement in the centre of the floor where we had test cleaned the tiles; the grout used was dark in colour which hides the dirt so unfortunately you cannot tell from the photograph the improvement in the grout. To get the tile and grout really clean a strong dilution of Tile Doctor Pro-Clean was applied and left to soak in to the surface for around ten minutes before scrubbing it into the tile with a bonnet machine fitted with a black scrubbing pad and also a stiff hand brush along the grout lines. This was then rinsed away with warm water all of which was removed by a wet Vacuum. 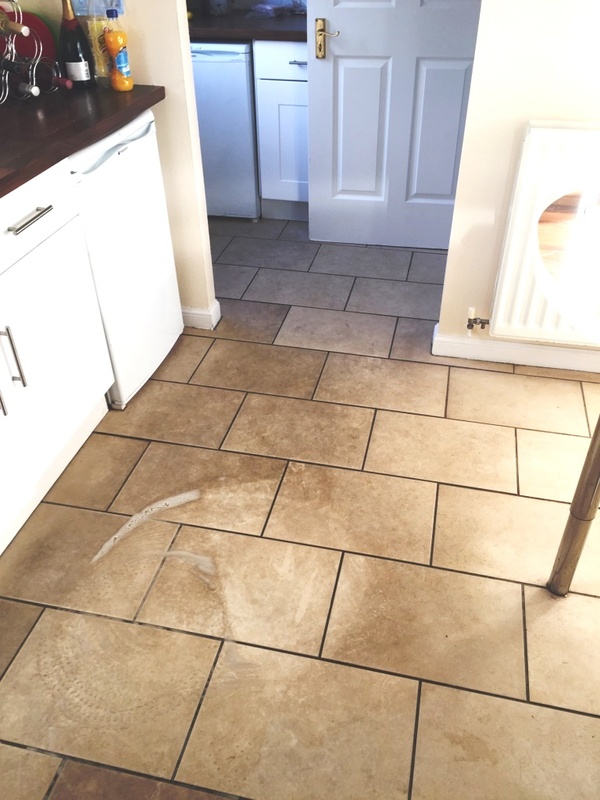 This whole process was repeated three times until we were satisfied that the tile and the grout was looking new again after which the floor was given a final wash with Tile Doctor Neutral Cleaner and then dried as much as possible using the wet vacuum. 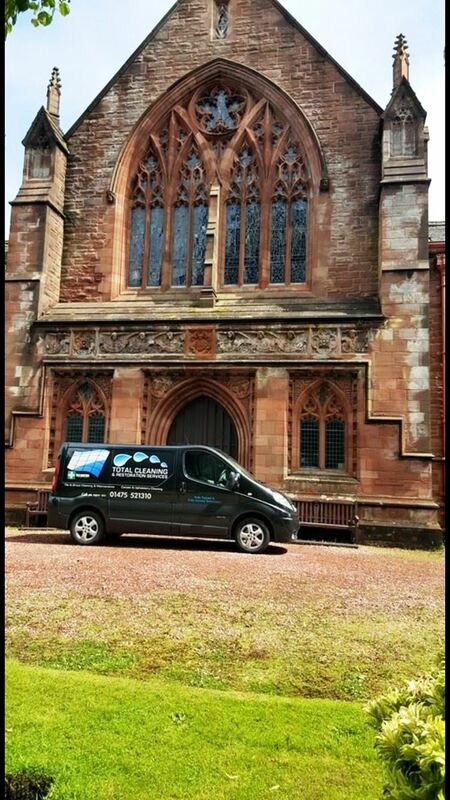 These photographs were taken some time ago however I thought they might be interesting as Glasgow has an interesting mix of architecture and occasionally we are asked to clean some unusual buildings including this one which had a stone winding staircase faced with slate tile which was overdue for a clean and seal. Stairs are a high traffic area and if there was any sealer left on the slate treads it was minimal so I decided to apply a strong dilution of Tile Doctor Pro-Clean. This was left on to soak into the slate tiles for about 20 minutes before being scrubbed in by hand (no room for a rotary machine). This was worked into the slate and grout until I was happy the tile and grout was clean. The soiled cleaning solution was removed using a wet vacuum and the floor neutralised with more water to ensure no chemicals remained on the floor prior to sealing. It was a small area so it only took a few hours for the tiles to dry so later that afternoon I was able to seal the slate for which we used five coats of Tile Doctor Seal and Go which adds a nice subtle sheen finish and will protect the tiles from staining going forward. 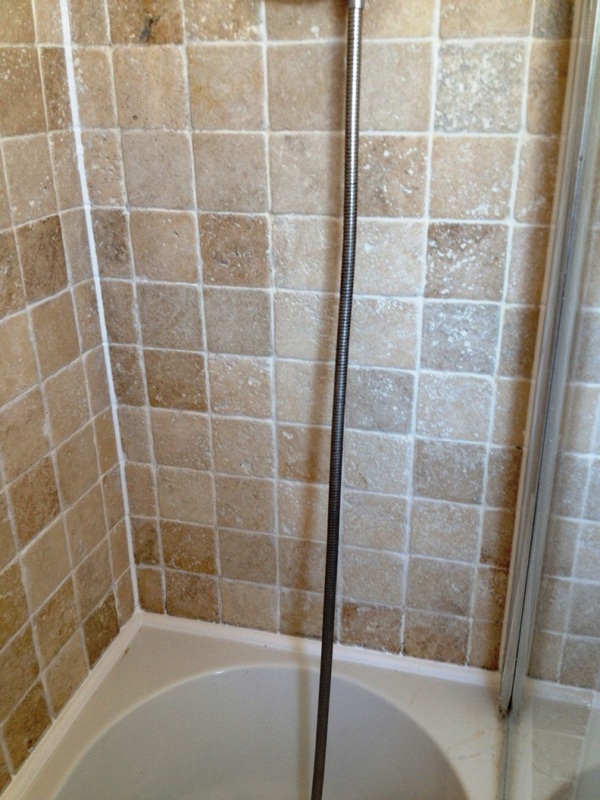 A customer contacted us regarding a Ceramic Tiled Shower Cubicle problem they had with their house in Glasgow. 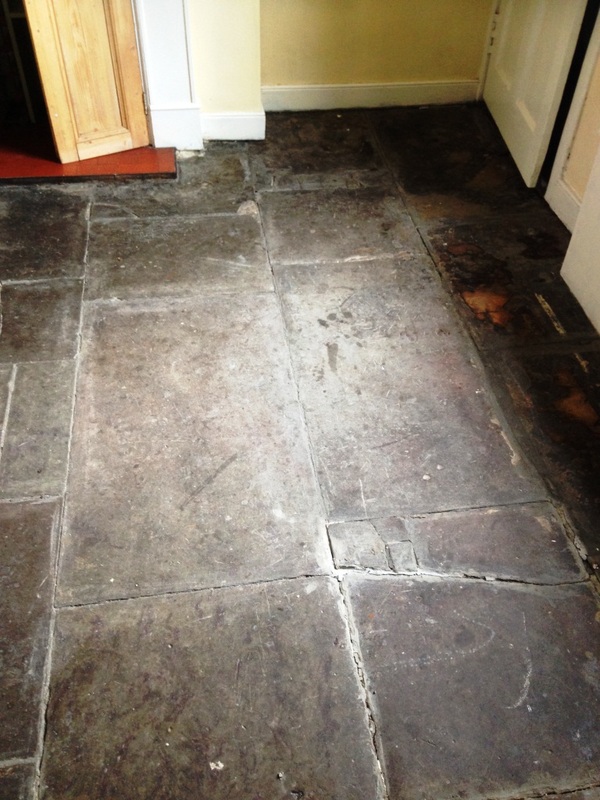 The grout and mastic sealant had started to discolour and there was staining on both from mould which is quite a common problem in modern houses and our busy lifestyles and insulated homes with insufficient ventilation. We started by giving the tiles a good scrub with Tile Doctor Pro-Clean then focusing on the grout we thoroughly scrubbed it with more Pro-Clean and a stiff grout brush, this process did well to clean up the tile and grout but unfortunately the grout had become too badly stained to be satisfactory. It’s a fact that the top layer of grout is actually porous and this is where the staining from the dyes in shampoos etc. will occur. The next step was to cut out all the old and mouldy mastic and seal around the shower using a sharp knife taking care not to scratch the shower tray. To overcome the stained grout issue we gave the whole of the grout two coats of white Grout Colourant which is a very effective treatment that forms an epoxy barrier over the gout protecting it from future staining. Normally when you do this we recommend using a pre-treater product that provides a chemical key that allows the colourant to latch on to, in this case however I was happy that the scrubbing we gave the grout with Pro-Clean would have the same effect. 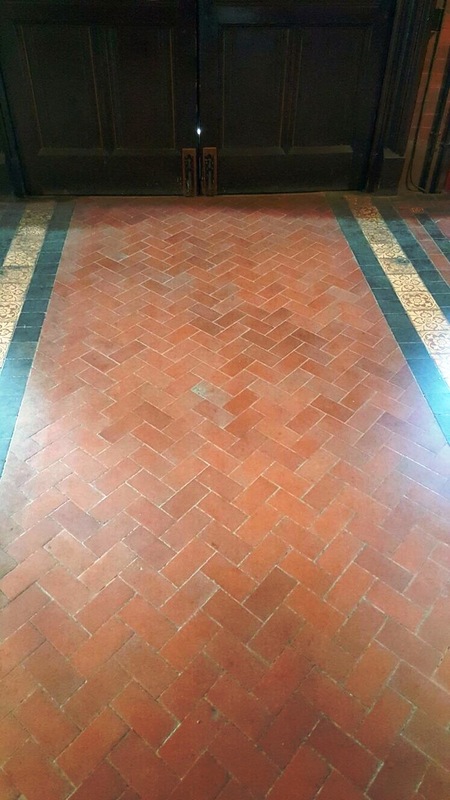 The tiles were then wiped down using Tile Doctor Neutral Cleaner to remove any excess colourant from the tiles and give them a finishing shine. The last step was to Shower was finished off by applying new silicone sealant to the areas that were removed. 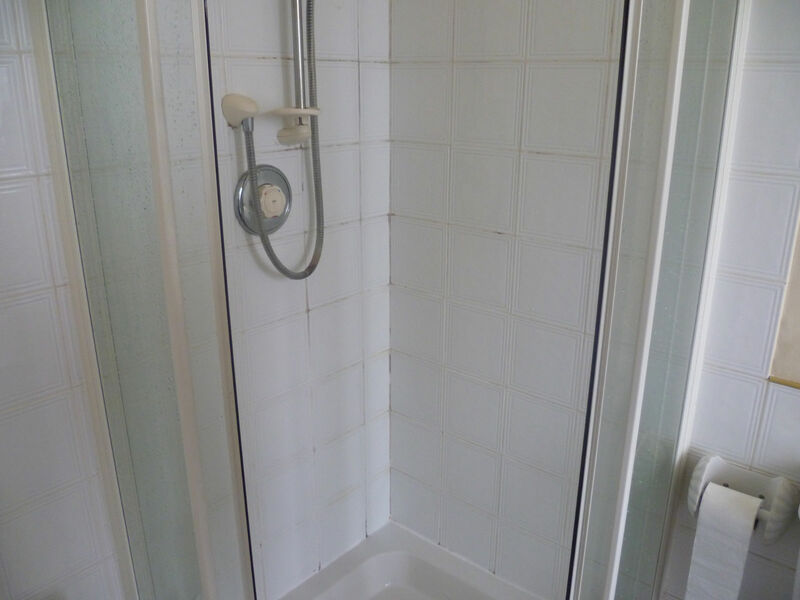 The final result was a shower cubicle that looked recently installed. 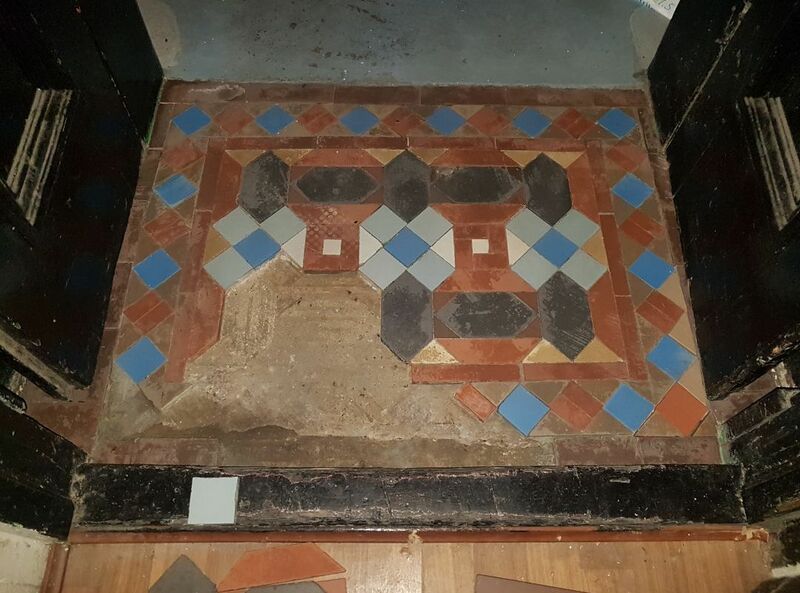 These unusual period Victorian mosaic tiled floor at a residence in the west end of Glasgow were far from looking their best and well overdue for a deep clean and re-seal. I’ll try and keep the details short so as not to lose your attention but basically the tiles were first stripped from all sealers and coatings that had been previously applied to the floor using a strong dilution of Tile Doctor Remove and Go which was left to dwell for an hour before working it in with a rotary machine fitted with a black scrubbing pad and then rinsing the floor with water which was extracted with a wet vacuum. Secondly we then cleaned the floor four times using a rotary machine and a strong mixture of Pro-Clean which was again wet extracted and rinsed again. Finally we cleaned and rinsed the floor using Tile Doctor Neutral Cleaner to neutralise the tiles from any products which may affect the sealer before leaving the floor overnight to dry assisted with a turbo air mover. 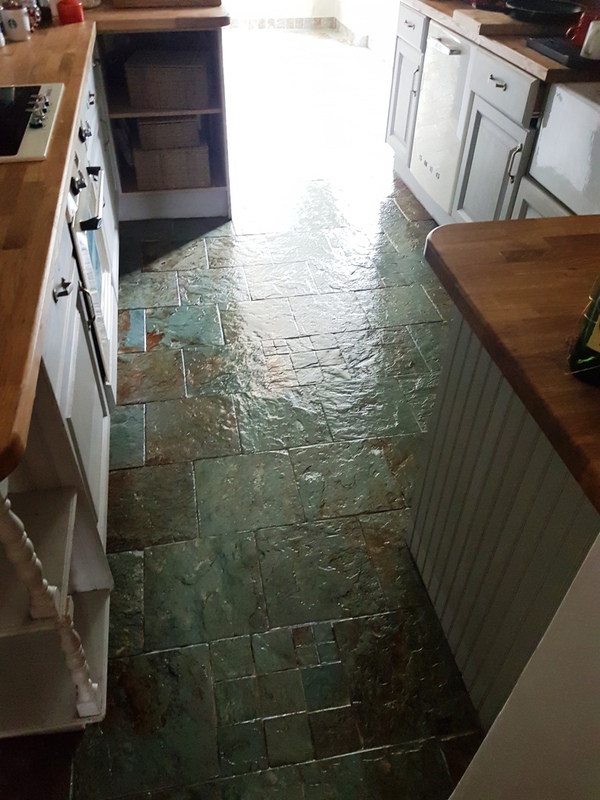 Once the floor was dry it was then sealed using two coats of Tile Doctor Colour Grow which brings out the colour in the tile and provides the matt effect the owners were looking for as well as protecting the floor from staining. 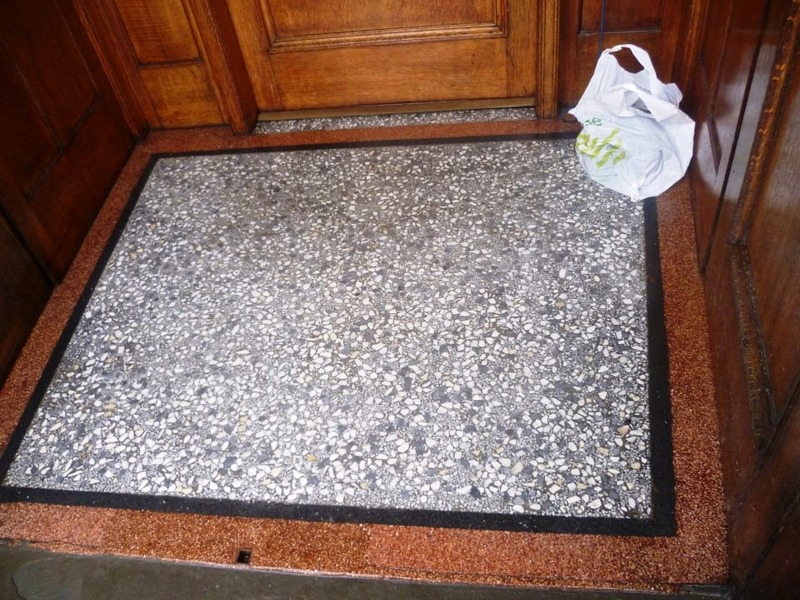 This Terrazzo Floor was at the entrance to a School in Kilmacolm where as you can see from the photograph below had come under some heavy use and was now proving difficult to keep clean. We were asked to give it a deep clean, polish and re-seal therefore making it much easier to maintain going forward. Hard stone surfaces such as Terrazzo have to be burnished to get the shine back and this process basically involves cutting back the surface with a set of diamond encrusted burnishing pads. Before burnishing however the floor was swept out to remove any loose debris that could get caught under the pads and scratch the floor. Once that was done a Coarse 400 grit burnishing pad was fitted to our heavy rotary machine and run over the surface with a little water to help lubricate the process, the coarse pad removes surface dirt and coatings such as sealers. Once that was finished we moved onto the medium 800 grit pad which is the first step of the polishing process and also removed ingrained dirt. 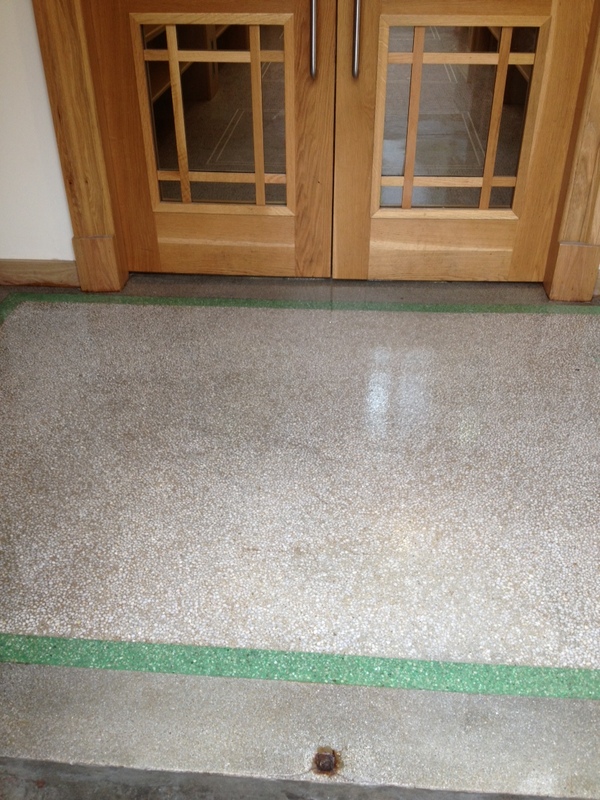 The surface of the Terrazzo is still quite rough at this stage so once complete with the medium pad the fine (1,500 grit) is used smooth down the surface and continue to build up the polish in the floor. The last pad is a very fine (3,000 grit pad) and this pad builds on the existing polished effect to create a high shine finish. All these pads are applied with water and the resultant slurry needs to be cleaned off during the process with the final step of giving the floor a thorough rinse with clean water, I can recommend a wet vacuum at this point as it makes light work of removing liquids from floors. 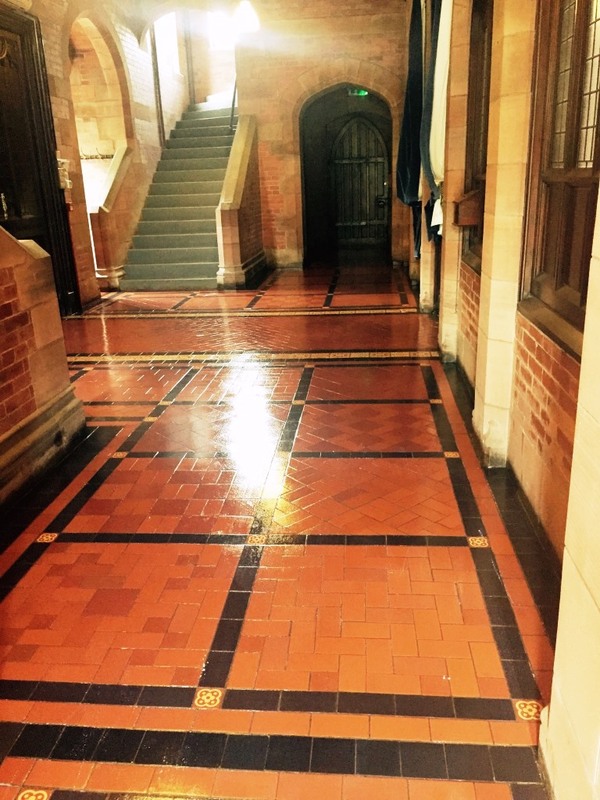 Once the floor was completely dry it was sealed using two coats of Tile Doctor Colour Grow which is a great product to use of these characteristic floors as it brings out the colour in the floor as well as providing on-going stain protection. The floor was then buffed using a white buffing pad to bring up the shine further; needless to say our client was extremely happy with the finished result. 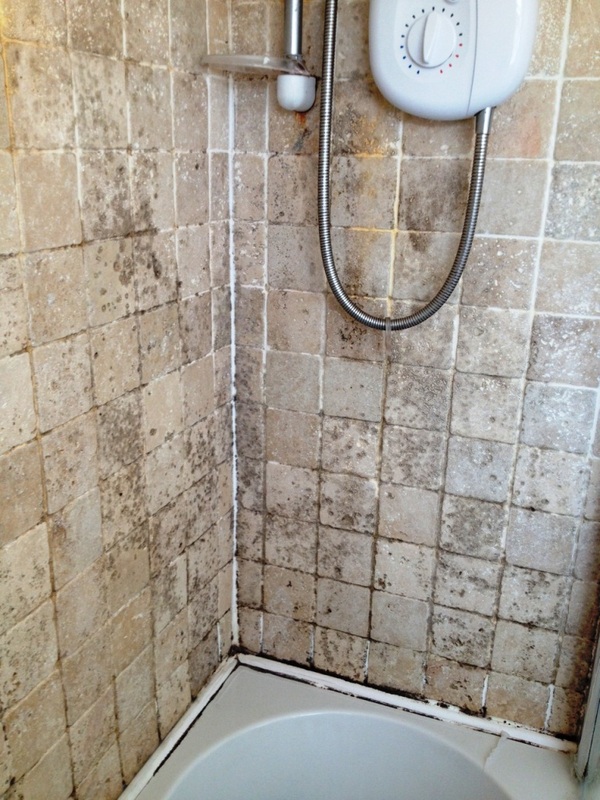 This mouldy filled Travertine tiled bathroom was located in a house in Glasgow and as you can see from the photograph below was completely covered in mould right round the whole bathroom, there was also some staining from the dyes in soap etc. 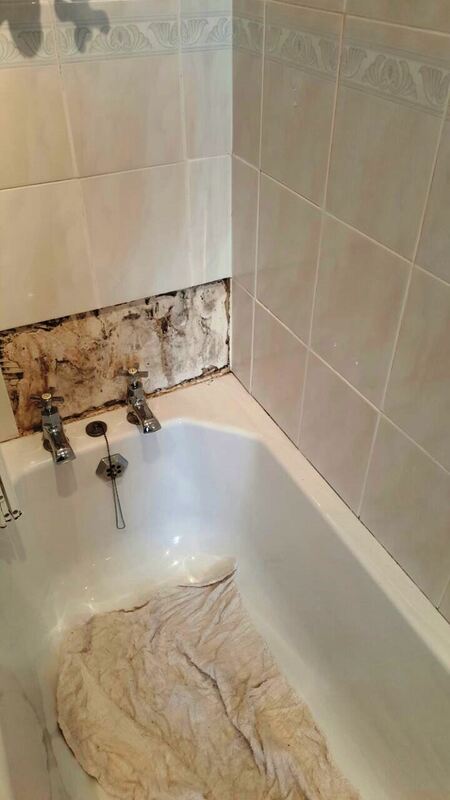 Firstly we cut out all the mouldy silicone with a sharp knife and once this was done we mixed a strong solution of Tile Doctor Pro-Clean in a spray bottle and sprayed the cleaning product onto the walls, we used a spray as the air makes the solution lighter and stick onto the tile. Once this was done the Pro-Clean was scrubbed into the stone with stiff brushes and a lot of elbow grease using small nail brushes to allow us to get into all the tiny dimples in the filled travertine. 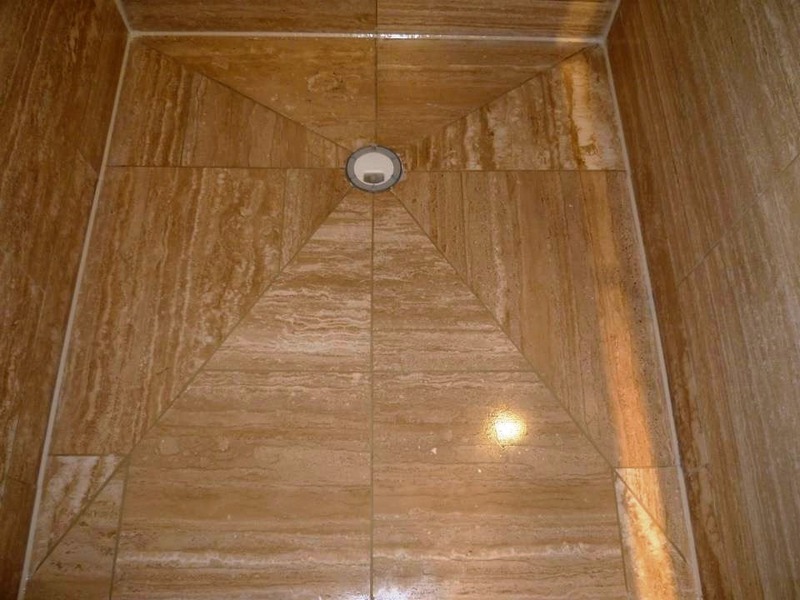 Travertine is a natural product so Pro-Clean being a strong alkaline product is ideal for cleaning natural stone as even mildly acidic cleaners can eat away at the stone. 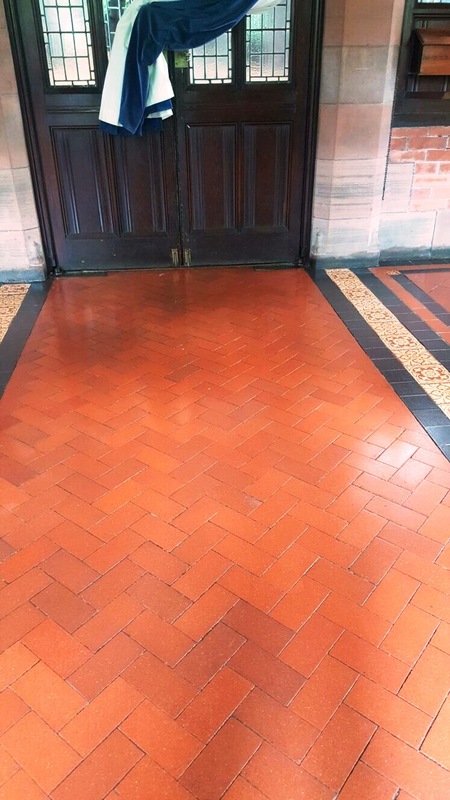 Once the tiles were cleaned they were then sealed with two coats of Tile Doctor Colour Grow which is a colour enhancing sealer which is designed to protect the stone whilst lifting the colours out. The grout was still discoloured following the cleaning process so to get it looking fresh again and after the stone was sealed we applied white grout colourant which brought the grout back to perfect white. This was done after sealing to stop the colourant absorbing into the tiles when they were un-protected making it easier to wipe off. 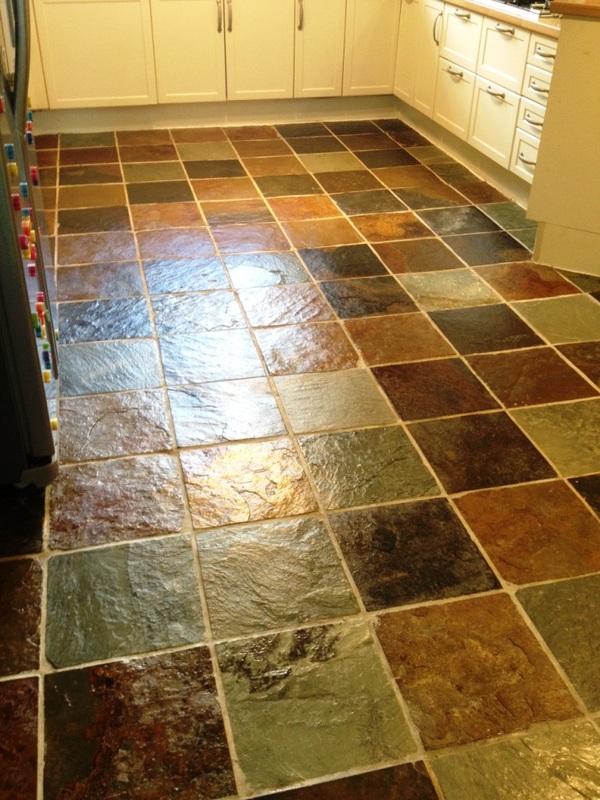 The grout colourant we use looks natural and also forms a barrier over the grout making it easy to clean. Once everything else was complete we finished the job off by renewing the white silicone up the corners of the walls and around the bath; the end result was a huge transformation that both us and the customer were more than happy with. 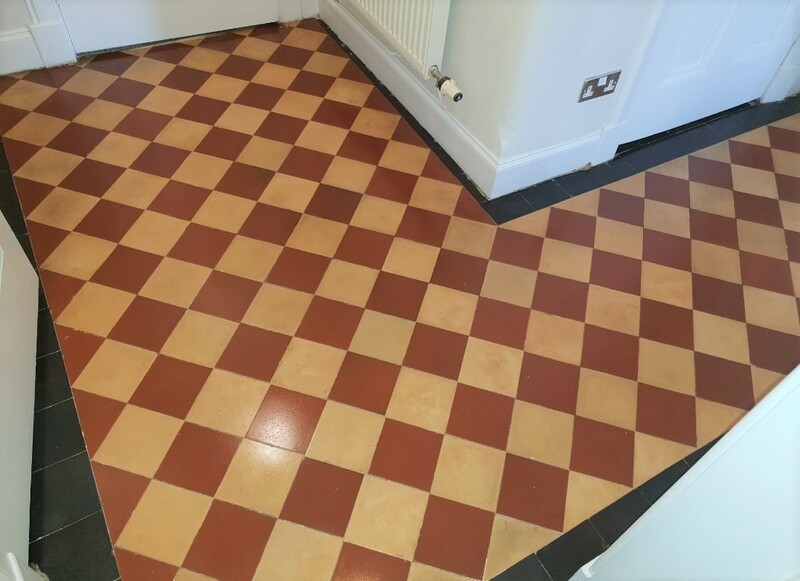 These Victorian tiles at a residence in Glasgow went through a dramatic change after we restored the colours and appearance. You can see from the photograph below the tiles were dull, stained and there was also paint splashes in various places. 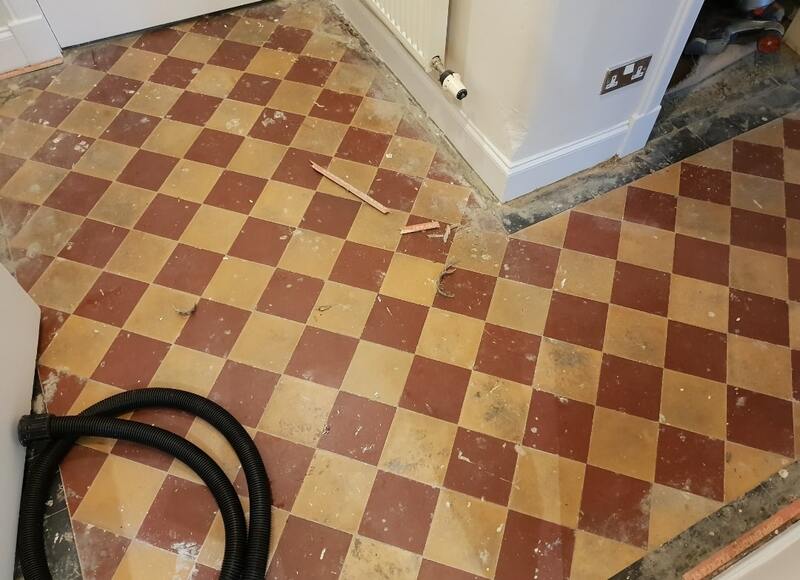 Firstly the floor was swept out and vacuumed to remove all loose debris; we then covered the entire floor with a strong solution of Tile Doctor Remove and Go combined 50/50 with NanoTech Ultra Clean which was left to dwell on the floor for an hour so it could soak into the tile. This floor did not have a previous sealer applied however the solution helped to break down the ground in dirt in the tiles and also remove the paint splashes. The dirty solution was then extracted off using a wet vacuum and the floor rinsed with clean water several times to remove any chemical residue. Next we mixed a 50/50 solution of Tile Doctor Pro Clean and NanoTech Ultra Clean which was then scrubbed into the tile using a black scrubbing pad on a rotary machine. 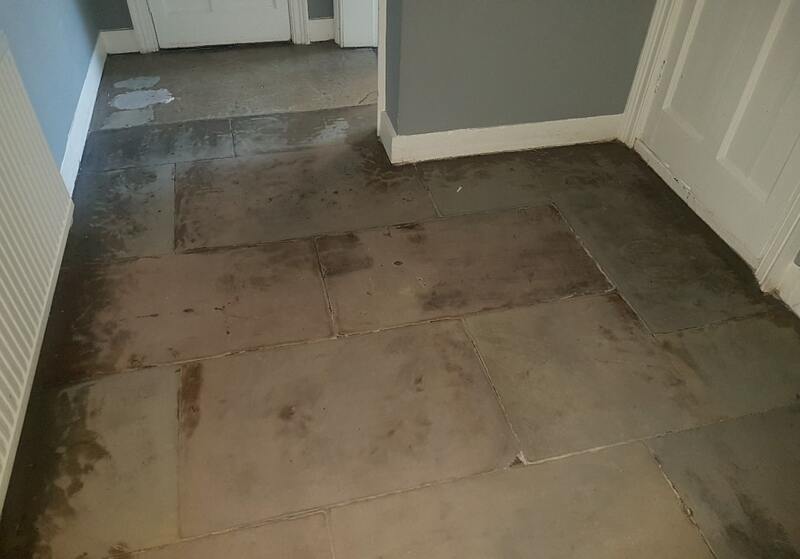 This was then removed and floor rinsed again and the floor was cleaned a further three times using a strong solution of Tile Doctor Pro-Clean and extracted with a wet vacuum again followed by a mopping of Neutral Tile Cleaner. 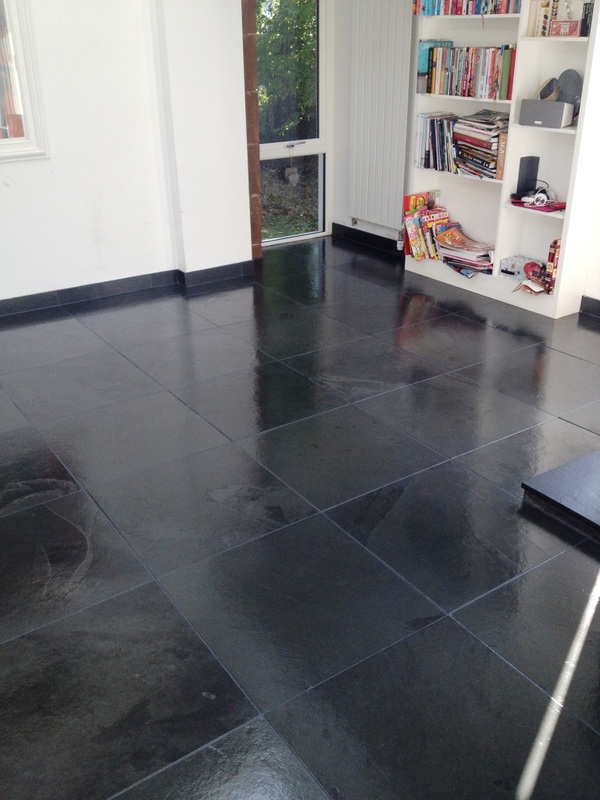 Once the floor was dry it was then sealed using four coats of Tile Doctor Seal and Go to achieve the finished result. 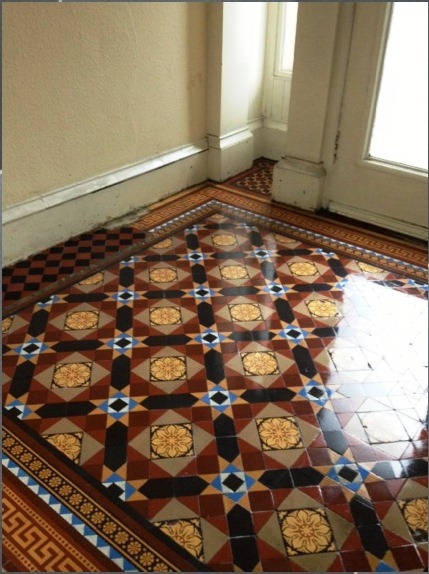 I recommend Seal and Go for Victorian tiled floors as it leaves a low sheen finish whilst providing excellent stain protection. 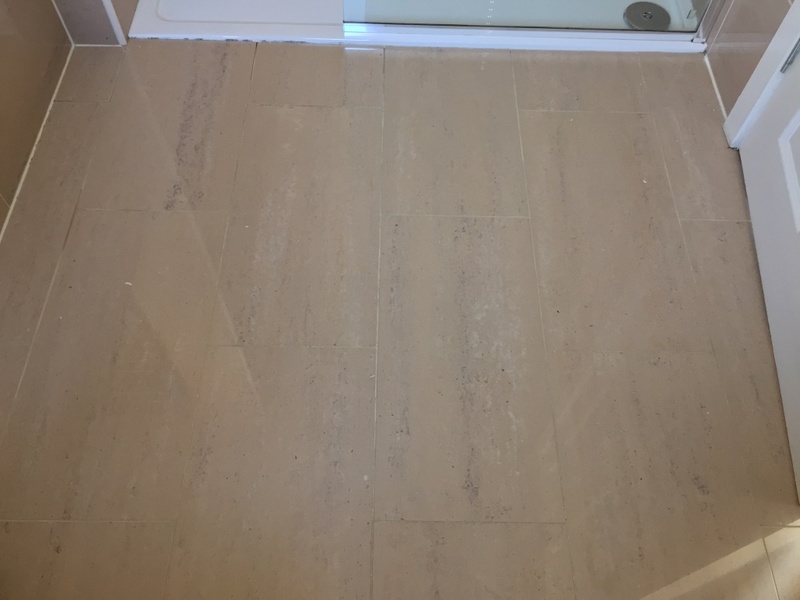 This Travertine wet room in Glasgow was in a sorry looking state, the tiles had become very dull and there was evidence of mould especially around the silicone. 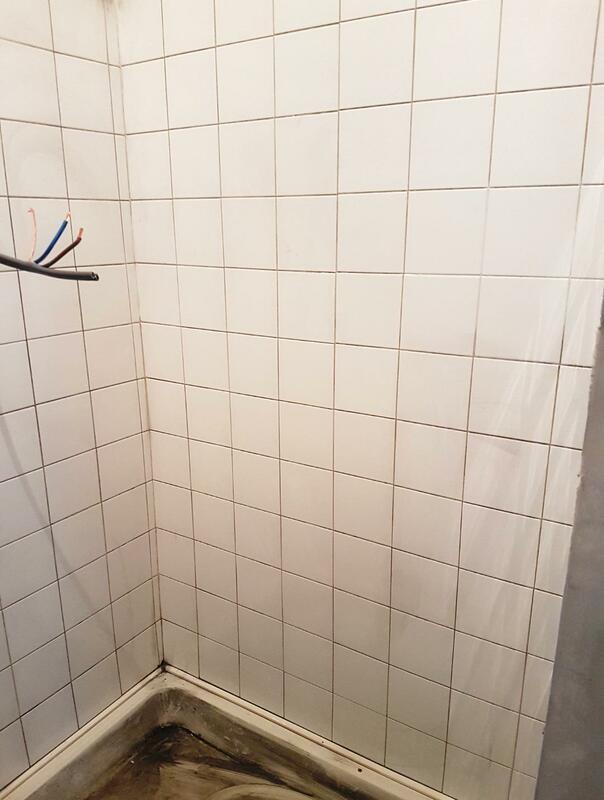 The first job was to cut out all the mouldy silicone around the bottom of the shower cubicle; which had the added advantage of allowing us to clean the adjacent tiles right to the edges. 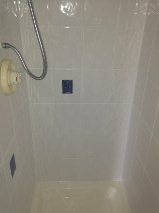 Once the silicone was removed we decanted a dilution of Tile Doctor Pro-Clean into a spray bottle and began to spray it onto the wall tiles. 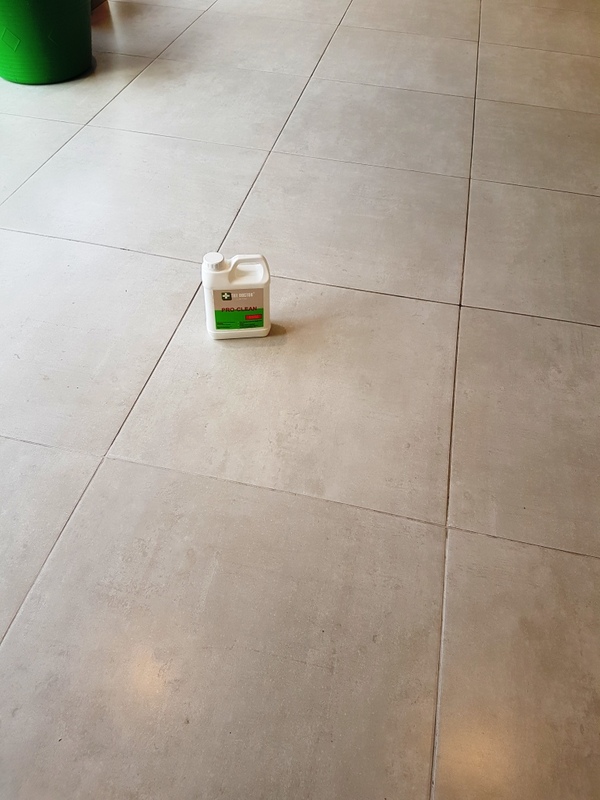 Pro-Clean in an effective alkaline tile cleaner designed for use on stone tiles such as Travertine, spraying the product onto the wall allows it to mix with air making it lighter and easier to stick and soak into a vertical surface. 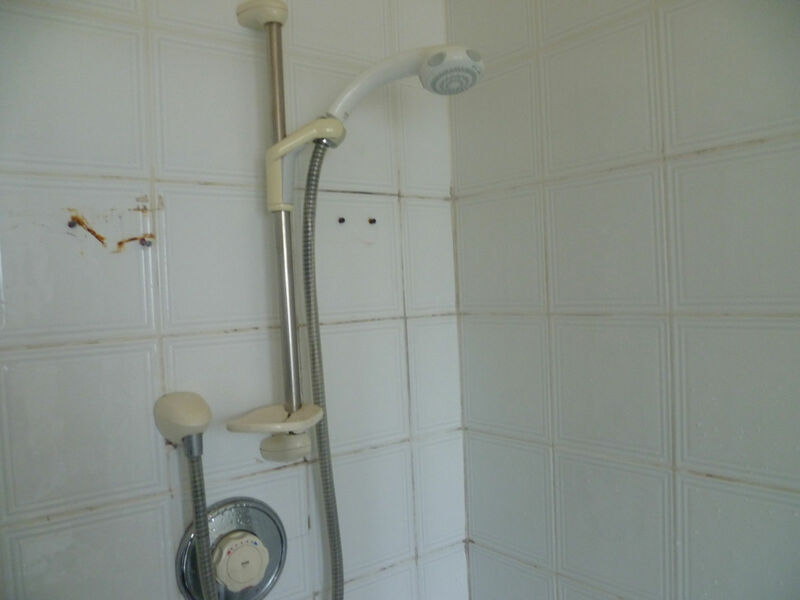 The wall tiles and grout were then scrubbed using a stiff brush until the dirt and mould had been cleaned away. 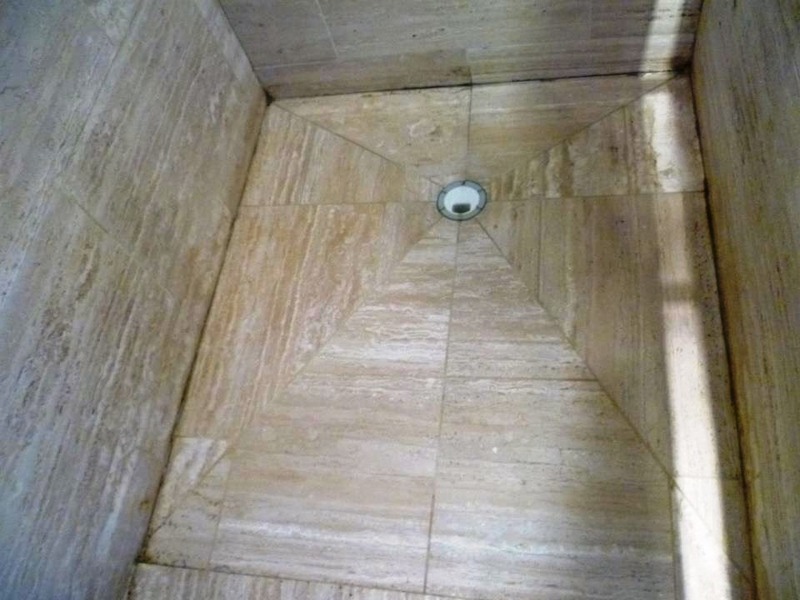 Once there tiles were free of dirt and mould we then used a set of six inch diamond encrusted burnishing pads with a hand held rotary machine to polish the travertine. The burnishing pads come in a set of four and you start with a coarse pad with a little water and work your way through the set moving from a the coarse pads through to the less abrasive pads; this process polishes the stone more and more until you get a smooth finish. Once the burnishing process was completed we then sealed the stone with two coats of Tile Doctor Colour Grow which is a colour enhancing sealer designed to protect the stone whilst lifting the colours out of the stone. Finally to finish off the job we renewed the silicone seal with Jasmine silicone around the floor and up the corners. The job took the best part of a day and I think you will agree the results speak for themselves. 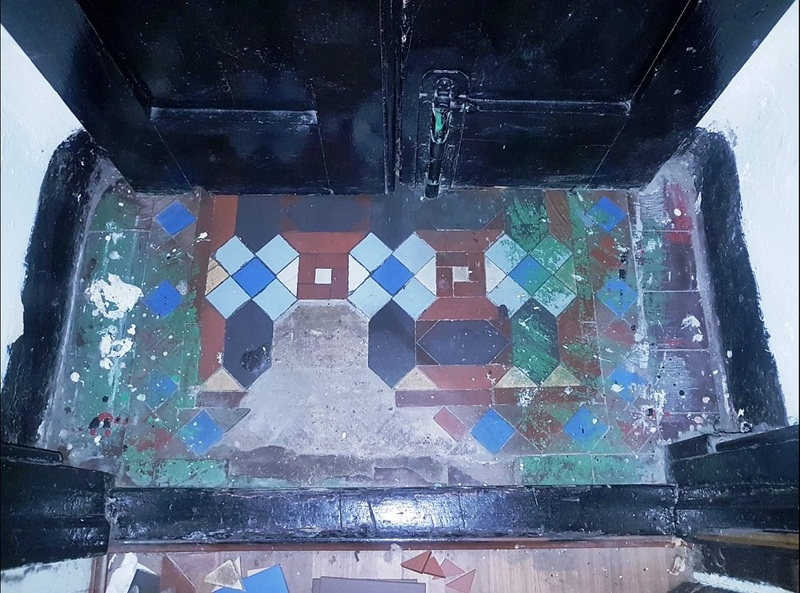 This Victorian tiled floor was located in the west end of Glasgow, the owner had discovered the tiles under the carpet and wanted to have them restored as an original feature. When we arrived the floor was still covered in carpet glue, cement, and hessian backing from the carpet that had been stuck to the tiles. The first job was to scrape off as much hessian backing and glue as we could with large scrapers and brushed all loose debris away. We then covered the entire floor with a strong solution of Tile Doctor Remove and Go combined with NanoTech Ultra Clean to create an effective coatings remover; this was then left on the floor to dwell for an hour in order to break down and soften the adhesive etc. The floor was then wet extracted and rinsed with clean water several times to remove any excess residue. This allowed us to see what glue was left which was then removed using a steamer. After this we cleaned the floor three times using Pro-Clean and a black buffing pad on a rotary bonnet machine to clean the floor; again all the dirty water was wet extracted with a wet vacuum and the floor neutralised with more water to ensure no chemicals remained on the floor prior to sealing. 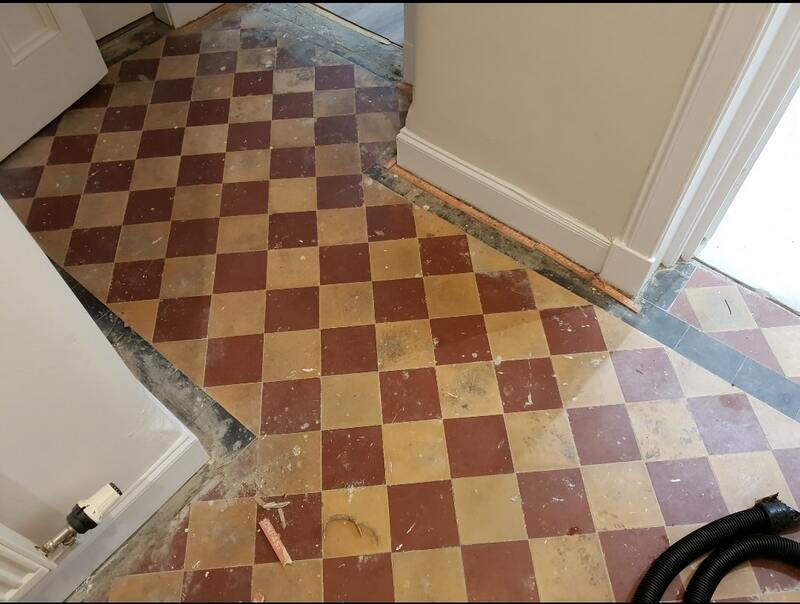 The floor was left to dry overnight and we came back the next day to seal it with four coats of Tile Doctor Seal and Go which is an ideal sealer for Victorian tiled floors as it leaves a low sheen finish whilst providing excellent stain protection. You have to wait for each coat to dry before moving on to the next so it did take a while. This was a tough job but certainly well worth the effort as the floor has been completely transformed and now looks fantastic.